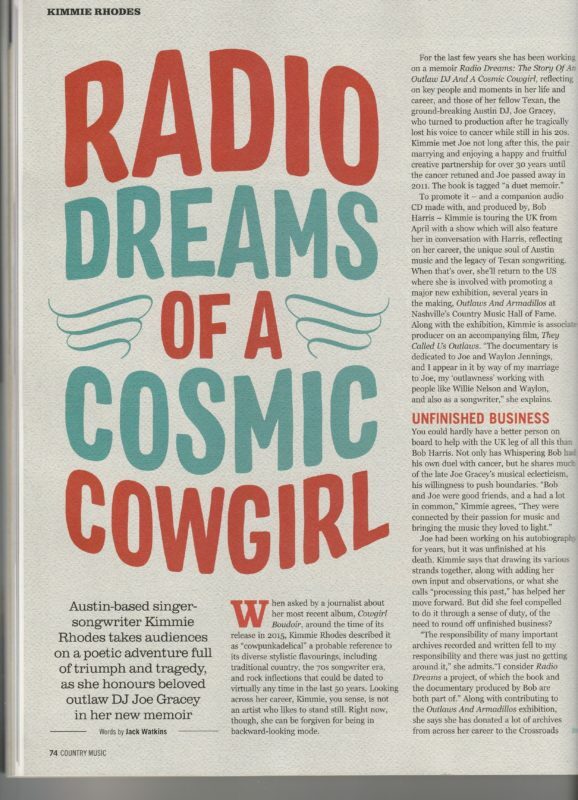 Fun things and many accomplishments have taken place since the release of my dual memoir “Radio Dreams: The Story of the Outlaw DJ and The Cosmic Cowgirl” last spring. We’ve been really busy here at Dancing Feet Press and Sunbird Music. 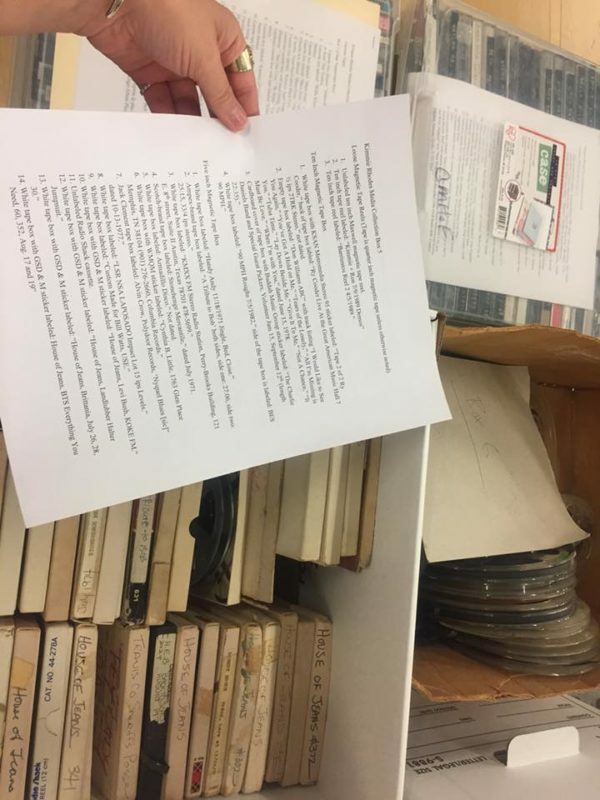 All of the many archives from Joe Gracey’s and my own careers have now been 99% processed, preserved and placed at both Crossroads of Music Archives/Southwest Collections Library – Texas Tech University, Lubbock, Texas and at The Country Music Hall of Fame Museum in Nashville, TN. 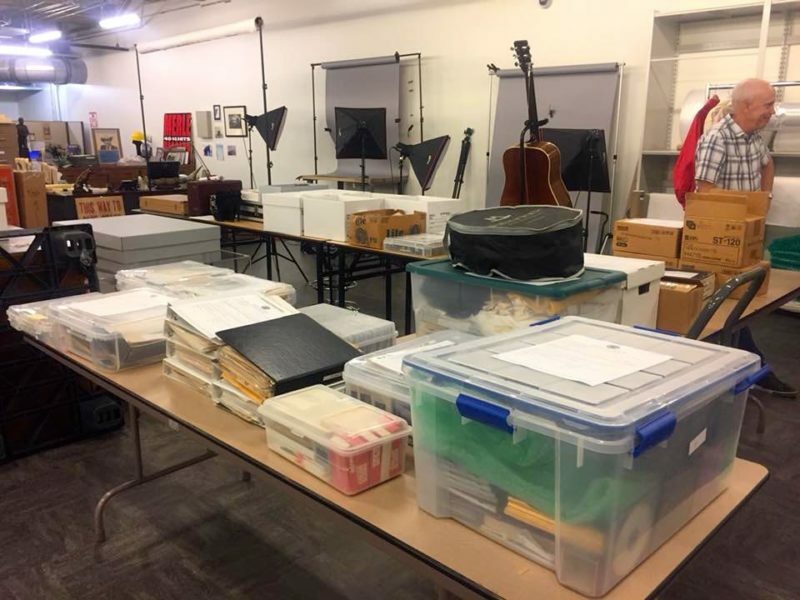 Last fall I worked with the folks in the archives department at CMHoF to finish making notes on the artifacts, documents and recordings that have been donated there in honor of Joe Gracey and his contribution to American Music. 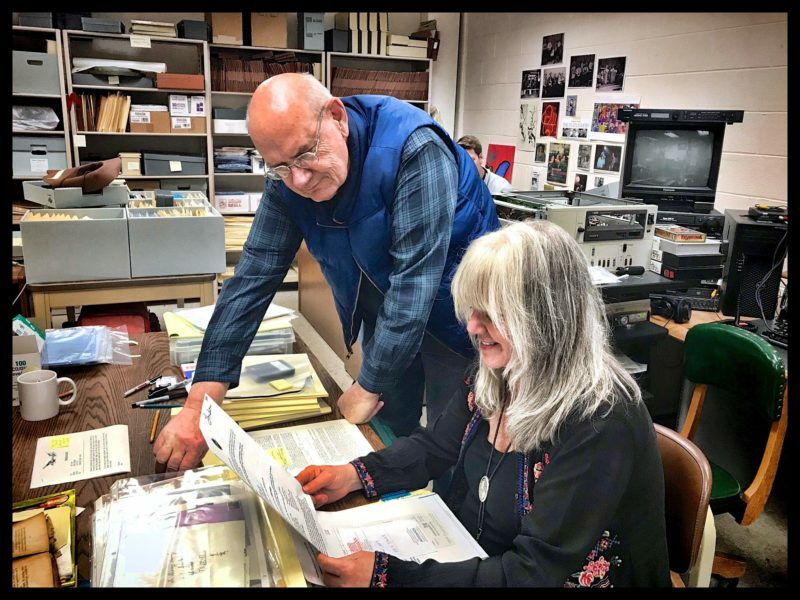 It’s an honor and it’s so great to know that the treasures from our decades of making music together have joined those two important collections where they will be readily available for study and research. It’s been quite a journey! It was one of those weekends for the music history books as artists from Texas and Tennessee joined the staff of The Country Music Hall of Fame for the opening weekend of “Outlaws and Armadillos: Country’s Roaring 70s” an exhibit that aims to put to rest the notions of rivalry and division between Nashville and Austin. 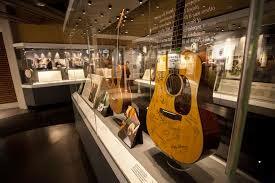 In fact the exhibition is a marvel of teamwork between Texans and Tennesseans. At the heart of the exhibit are vignettes of footage produced by filmmaker Eric Geadelmann. Kimmie has served as a liaison and associate producer for that documentary which is still in progress. “They Called Us Outlaws” once completed will be a six part twelve hour series. Eric co-curated the exhibit with staffers Peter Cooper and Michael Gray. The stellar line-up assembled for the opening night concert. 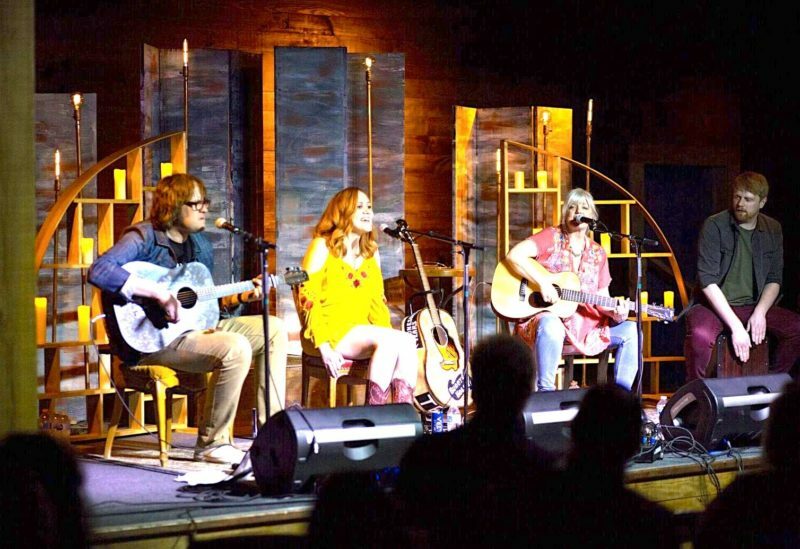 Texans and Tennesseans were backed by an all-star house band put together by Dave Cobb and Shooter Jennings. 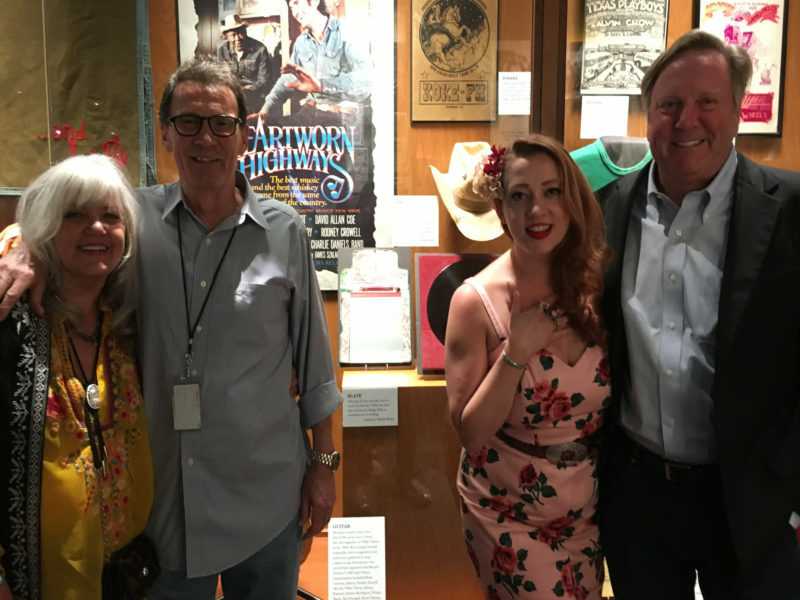 Kimmie Rhodes, David Conrad, Jolie Goodnight Gracey and Bill in front of the display case which features Joe Gracey’s hat signed by Ernest Tubb, test pressing of Double Trouble Stevie Ray Vaughan, magic slate used by Gracey and rare KOKE-FM poster. 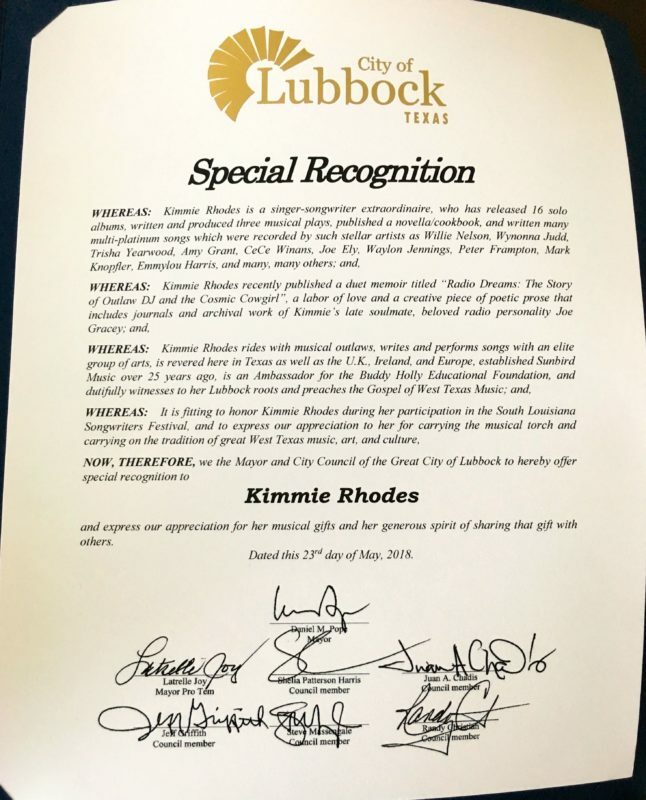 Much gratitude to Mayor Pro-tem Jeff Griffith, The Buddy Holly Education Foundation and The South Louisiana Songwriters Festival & Workshop for a great few days in lovely Louisiana… especially to my home town Lubbock Texas for the special recognition and wonderful introduction to my show in Lafayette! A great honor! 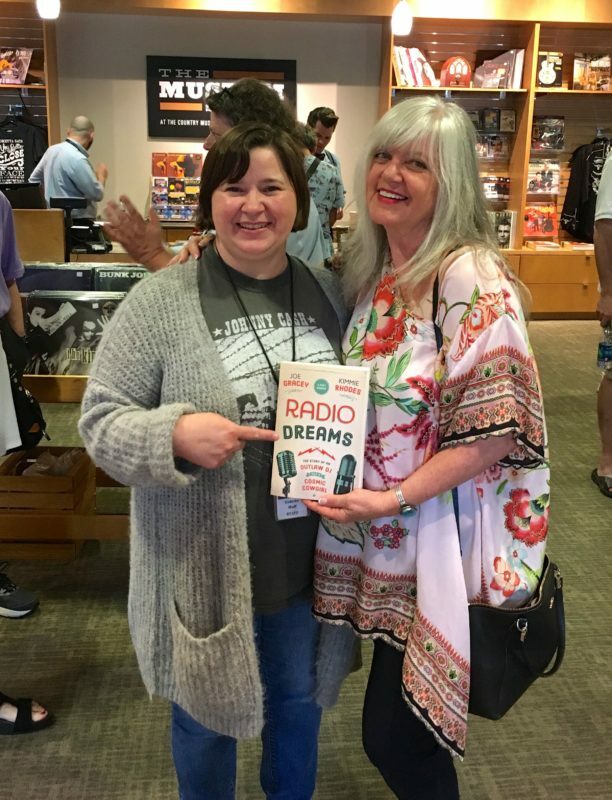 The Radio Dreams Project with Kimmie Rhodes and Jolie Goodnight Gracey, visit The Country Music Hall of Fame Museum bookstore and archives department to celebrate the release of Radio Dreams and the donation of many of our precious archival artifacts and documents. It’s a really good feeling to know that Gracey’s book is finally finished and that all the wonderful things we held onto through the years, writings, periodicals, pictures, platinum records, instruments, audio and video tapes, test pressings, stage clothes, countless various souvenirs from our years of making music will be cared for in the best possible way and in safe keeping. Thanks so much to the minions of musicology who care about and honor our experiences and memories! 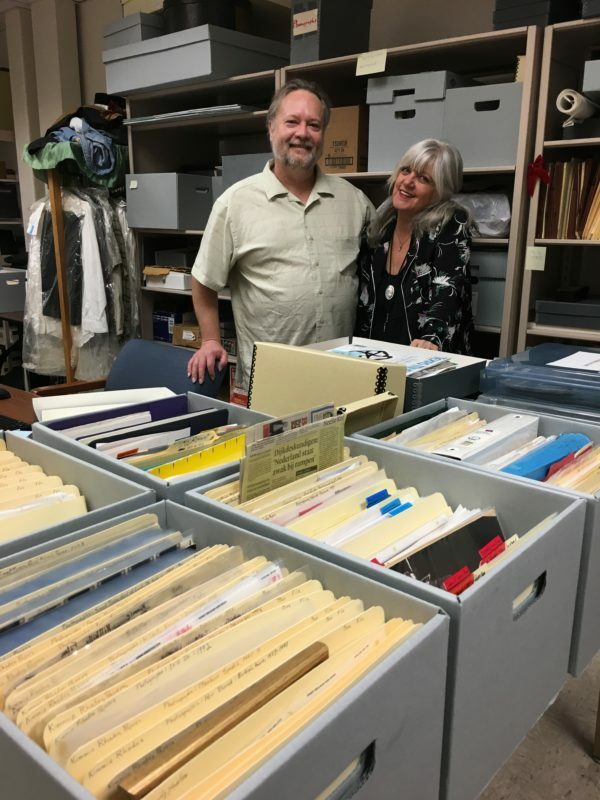 We hope others will entrust their treasures to museums and archives where they can be preserved, catalogued and shared with future generations of music lovers. 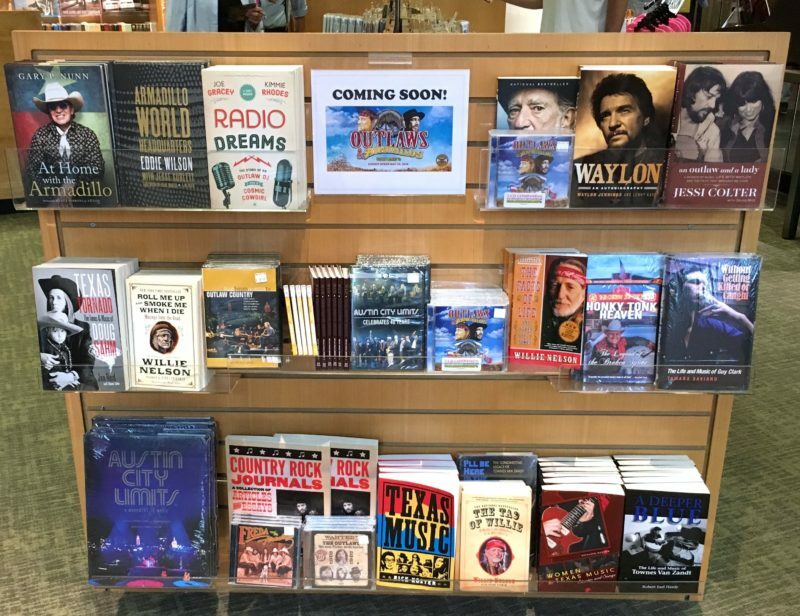 We are proud to have our dual memoir “Radio Dreams The Story of The Outlaw DJ and The Cosmic Cowgirl” in the bookstore at The Country Music Hall of Fame Museum. 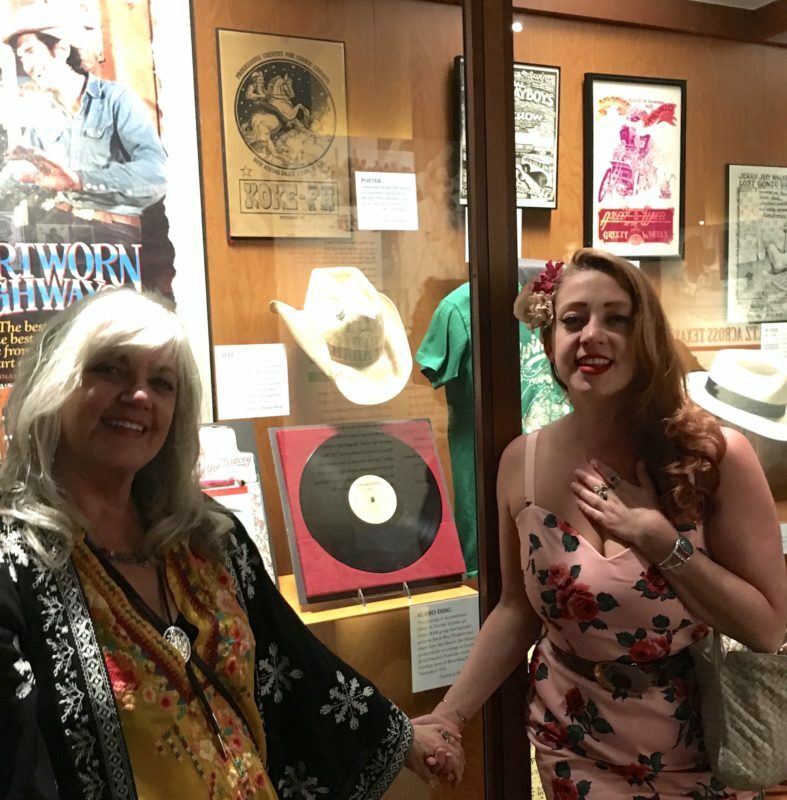 We are in great company with books by or about our fellow friends, Gary P. Nunn, Willie Nelson, Eddy Wilson, Jesse Sublett, Waylon Jennings, Jessi Colter, Guy Clark, Tamar Saviano, Townes Van Zandt, Kathleen Hudson and others! After a really memorable day at the museum, including a sneak peek at the museums soon to open “Outlaws and Armadillos: Country’s Roaring 70s” exhibit that pays tribute not only to Joe Gracey and his contribution to American music history but that of our many friends and heroes we followed with a gig at the famous Bluebird Cafe next night. 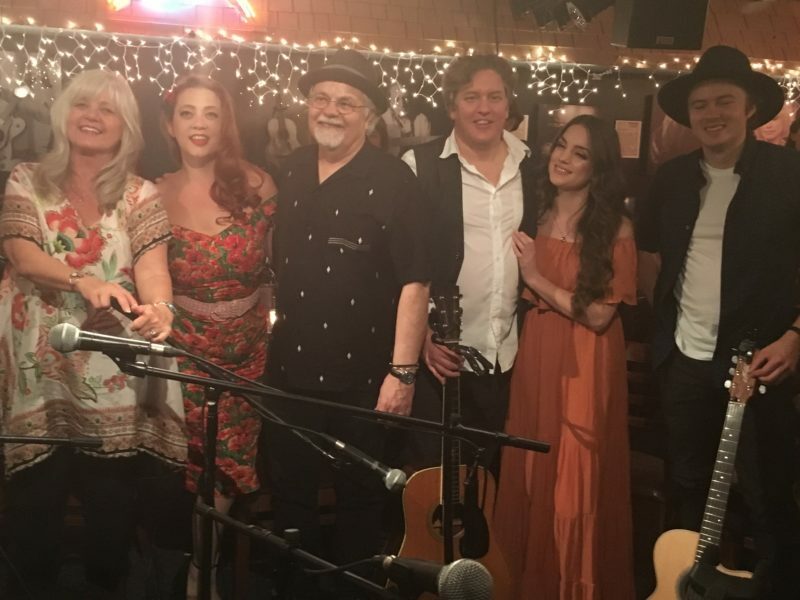 (left to right) Kimmie Rhodes, Jolie Goodnight Gracey, Gary Nicholson, Shawn Camp, Lauren Mascitti and Joe Robinson after their show at The Bluebird Cafe in Nashville. A fascinating, intimate and spontaneous evening of stories and songs with legendary singer/songwriter Kimmie Rhodes (accompanied by multi-instrumentalist Gabriel Rhodes with special guest Robert Vincent) in conversation with broadcasters, BBC Radio 2 Bob Harris OBE, BBC Ulster Ralph McLean and RTE Dublin Sandy Harsh, reflecting on Kimmie’s rich musical history, the sounds of Austin and the legacy of Texan songwriting. There’s a good reason Bob Harris is known to his fans as ‘Whispering Bob’. His voice is delightfully mellifluous – velvet coated, soothing and engaging. 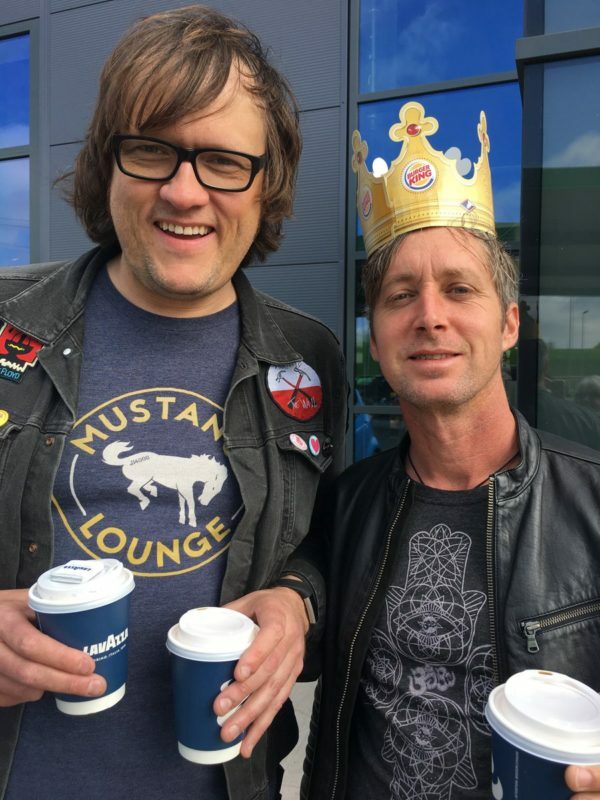 Whether he is regaling you with an anecdote about his wild rock & roll years – when he partied with John Lennon, Bob Marley and David Bowie – or sharing a tip about a new artist you really ought to listen to, he does so with a lilting, almost hypnotic tone – and you can’t help but hang on every word. The face – and voice – of The Old Grey Whistle Test, he pioneered serious music broadcasting in the 1970s. Now aged 73 – he has just celebrated his birthday – he is championing country music. The darling of Nashville and Austin, he is successfully introducing a new generation of US country stars to the British, and vice versa, and helping the genre become the phenomenon it has become. 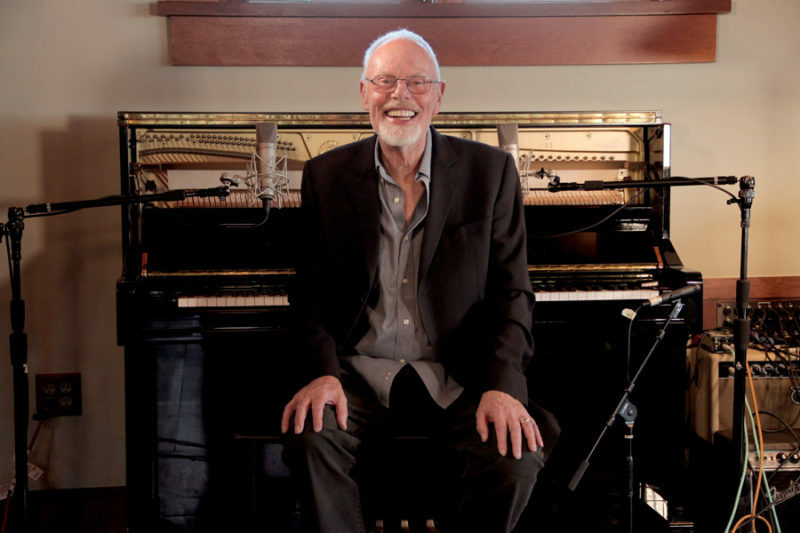 He spends his time zig-zagging between his home in Steventon, near Abingdon – where he records his hugely popular Bob Harris Country show for BBC 2 – and the United States. 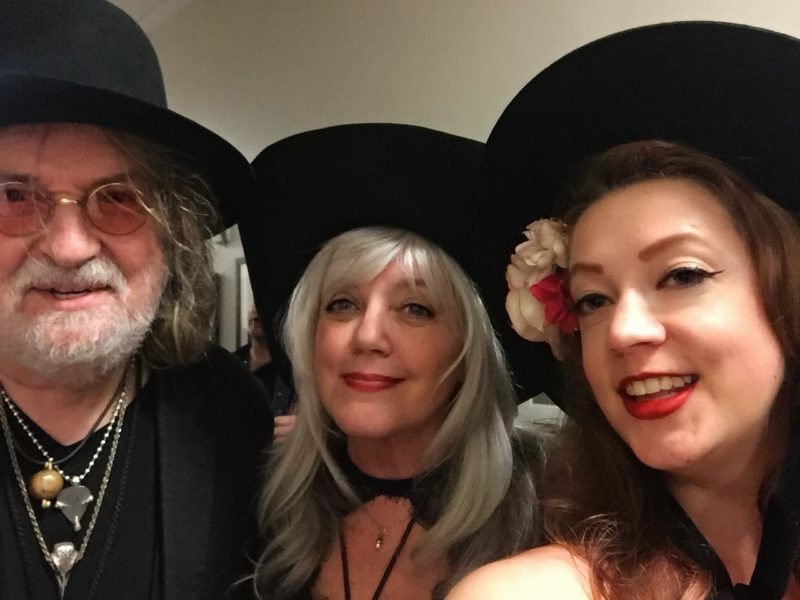 In recent months he has recorded from former Fairport Convention guitarist Richard Thompson’s home in Malibu, Judith Owen’s house in New Orleans and Beth Nielsen Chapman’s place in Nashville. 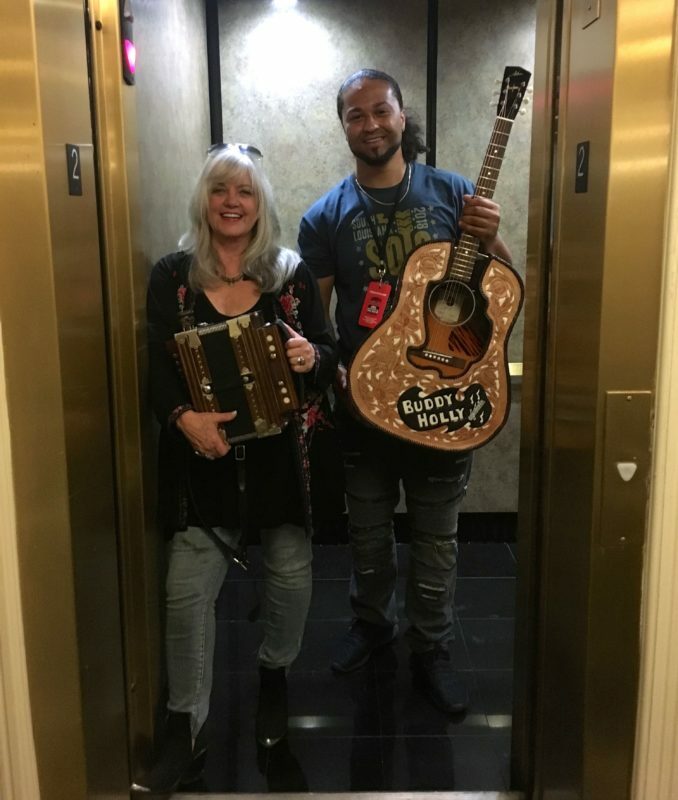 This week, Bob changes things around by inviting over to his place one of country music’s biggest stars – Kimmie Rhodes. 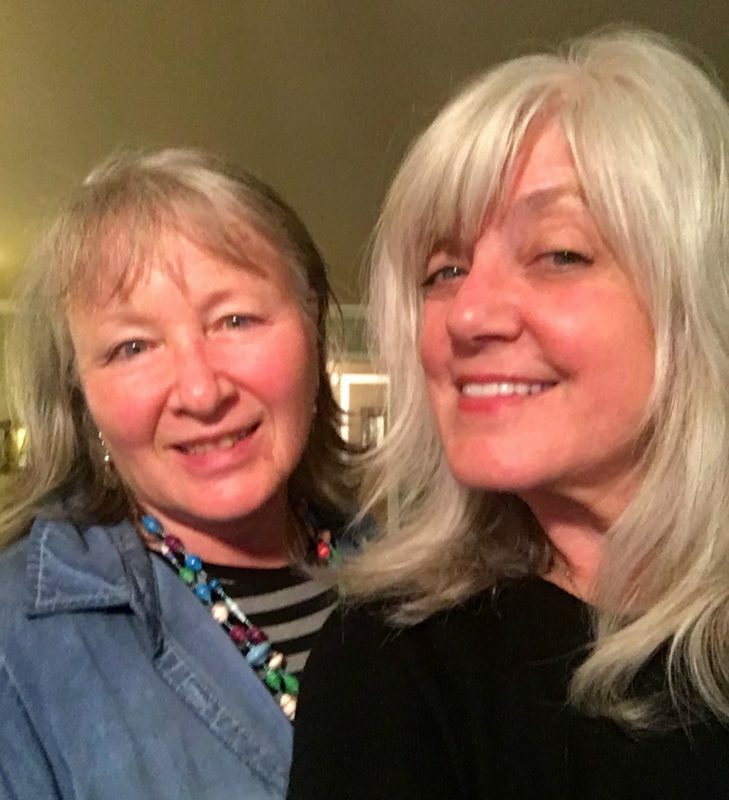 The pair’s Radio Dreams show will give us a chance to hear the broadcasting legend in conversation with Kimmie, sharing stories about her life and career, and that of her late husband and soul mate, US radio personality Joe Gracey Jr. 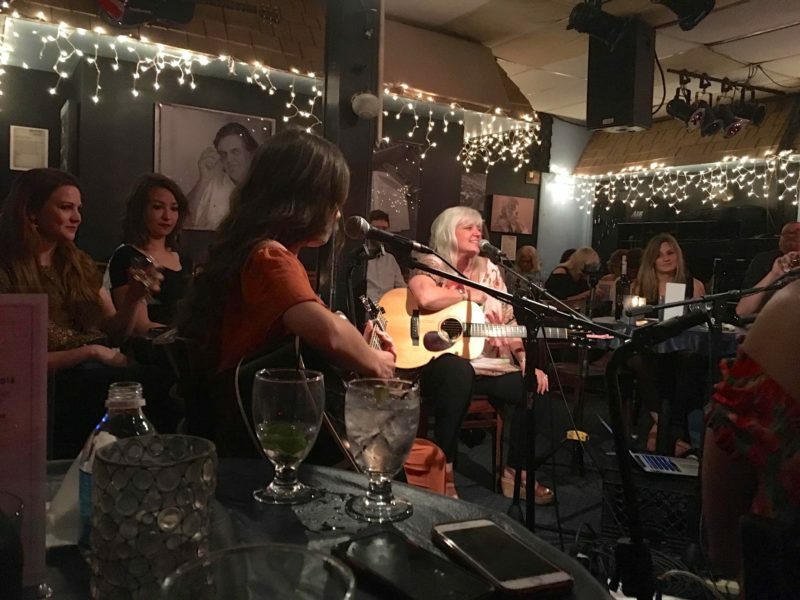 It will also see her playing some of her own tunes live. They will be joined by one of Bob’s current hotly-tipped artists, Robert Vincent. 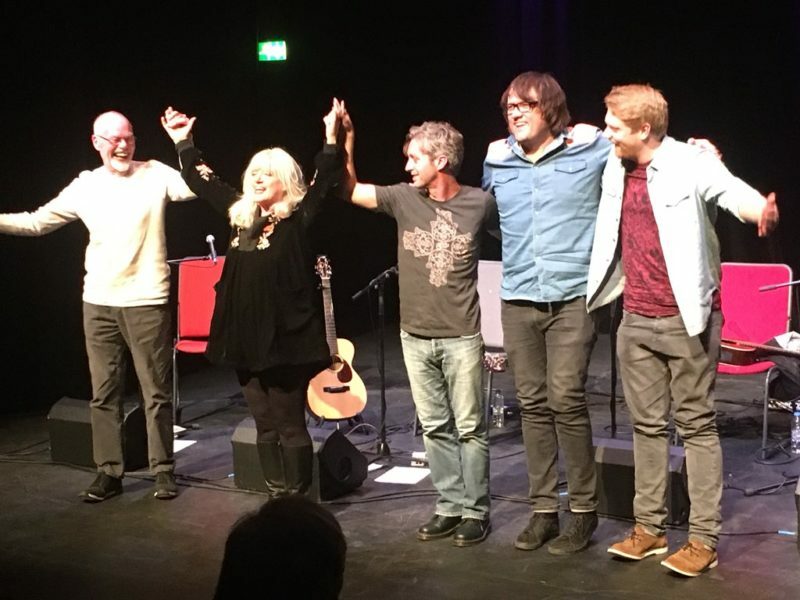 The tour starts tomorrow at Bush Hall, London, moving on to The Stables in Milton Keynes on Sunday and The Cornerstone, Didcot – a guitar pick’s throw from his home – on Tuesday. “It’s going to be fabulous,” he says. 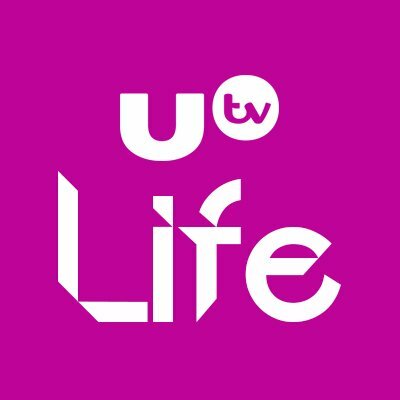 He will be joined by his wife Trudie, son Miles, and trusty assistant producer – and The Oxford Times photographer – Marc West, who help run his Whispering Bob Broadcasting Company (WBBC) from Bob’s Under the Apple Tree studio – appropriately situated in the middle of an orchard in his garden. One of the greats of country, Kimmie’s contribution to music cannot be overstated. 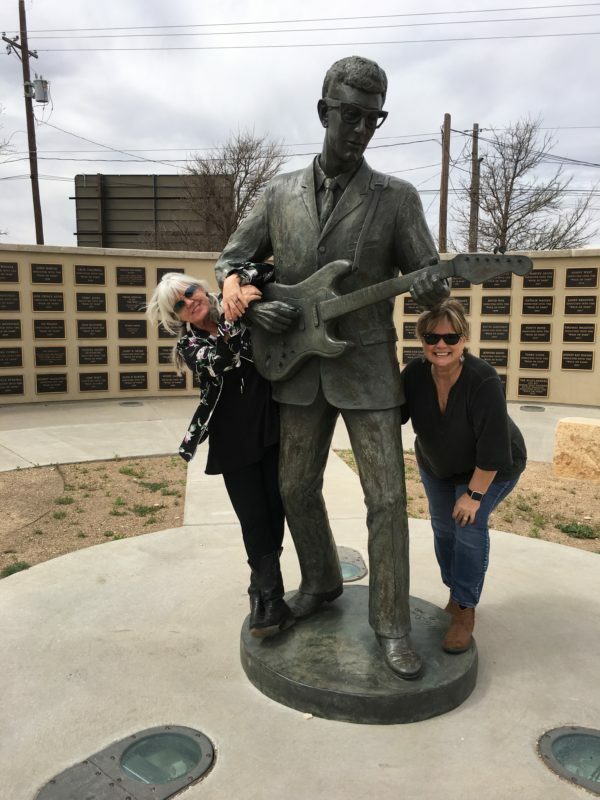 Raised in Lubbock, Texas – the hometown of Buddy Holly – she has recorded 16 albums, contributed to a string of film soundtracks and had her songs covered by Willie Nelson, Wynonna Judd, Trisha Yearwood, Waylon Jennings, Peter Frampton, Mark Knopfler and Emmylou Harris. 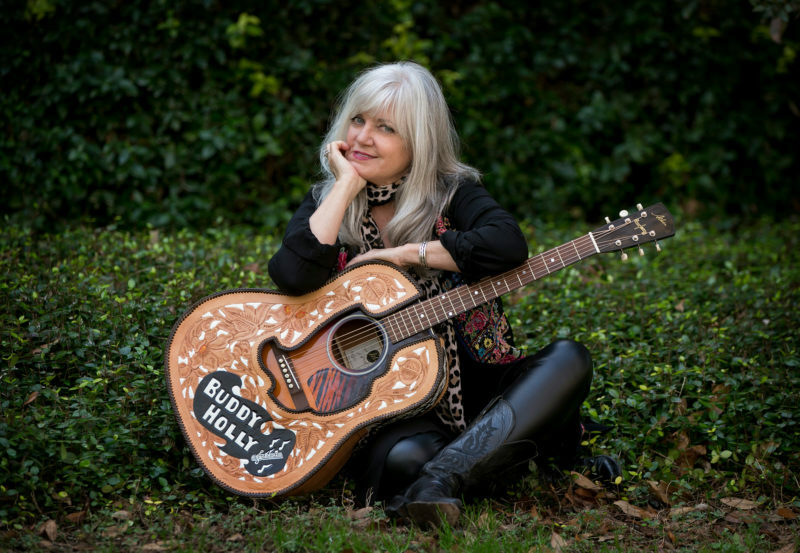 The platinum-selling songwriter will share tales of her and Joe’s three decades together. It’s a story of triumph and tragedy, ending in Joe losing a hard fought battle with cancer. 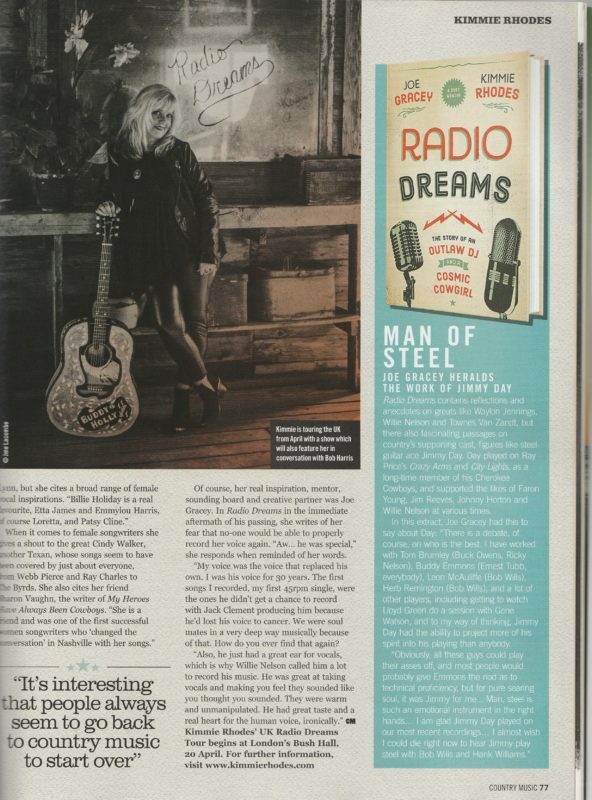 “Radio Dreams is the result of a collaboration between Kimmie and Joe, who was a hugely important figure in the emergence of the country scene in Austin in the 70s,” says Bob. 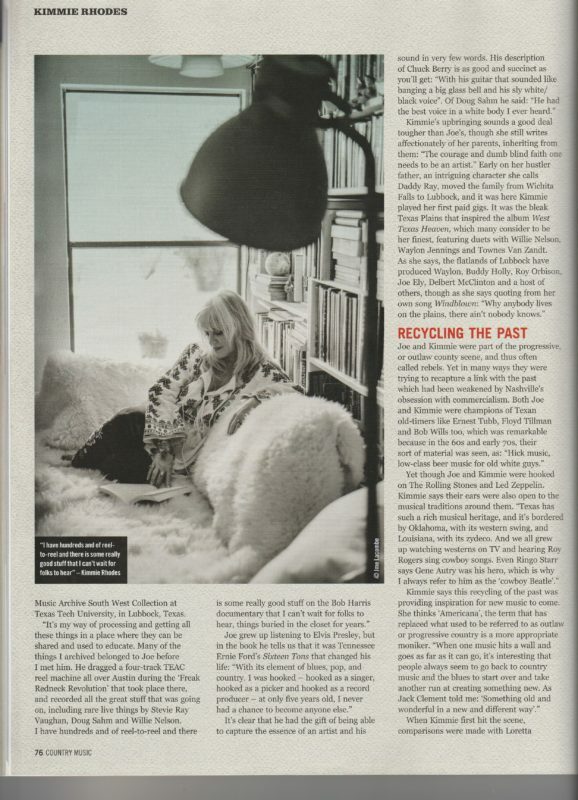 “He sort of did what I do – playing what he liked and discovering new artists. And he touched a chord. “Sadly he got cancer and lost his tongue, which took away the very thing that made him famous, so he moved into production. 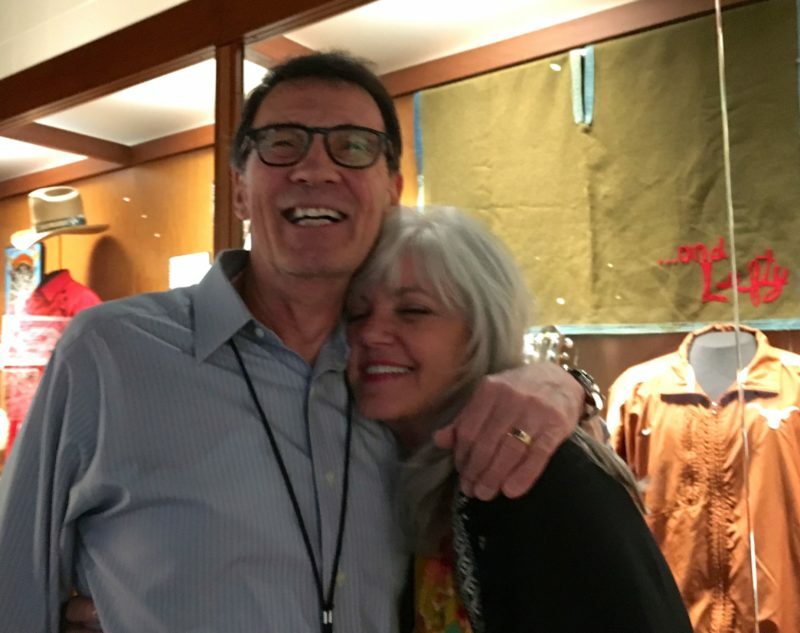 Bob, who himself fought off prostate cancer, has recorded a companion audio documentary and retrospective CD with Kimmie. The project follows a fruitful period for Bob, which saw him once again at the helm of The Old Grey Whistle Test for a one-off show to mark the 30th anniversary of its final broadcast. “It was such a dream to do it,” says Bob. “The look of the show was the same as when we started out – and there was so much love in the room. “It made a huge impact. It saw one of BBC4’s biggest audiences ever, with well over a million people watching it, and it showed how much love there is for the programme. It also shows the popular presenter at the top of his game. He adds: “You are always going to have ups and downs but there are so many wonderful moments, and I am keeping fit, walking five miles a day around the village. That’s the reason I’ve got so much energy to sustain all this. And broadcasting remains a passion. “I love doing it,” he says. “I love getting the CDs every morning, going to the studio, finding out about new albums and putting on a show. 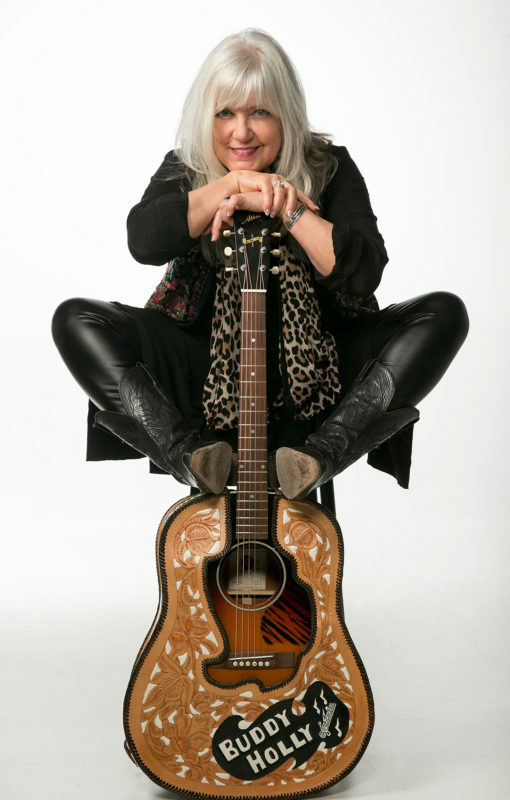 Touring in support of her new memoir, ‘Radio Dreams’, Kimmie Rhodes performs classics songs in an intimate setting, and recalls meeting country outlaw Willie Nelson at the famed Cut-N-Putt. 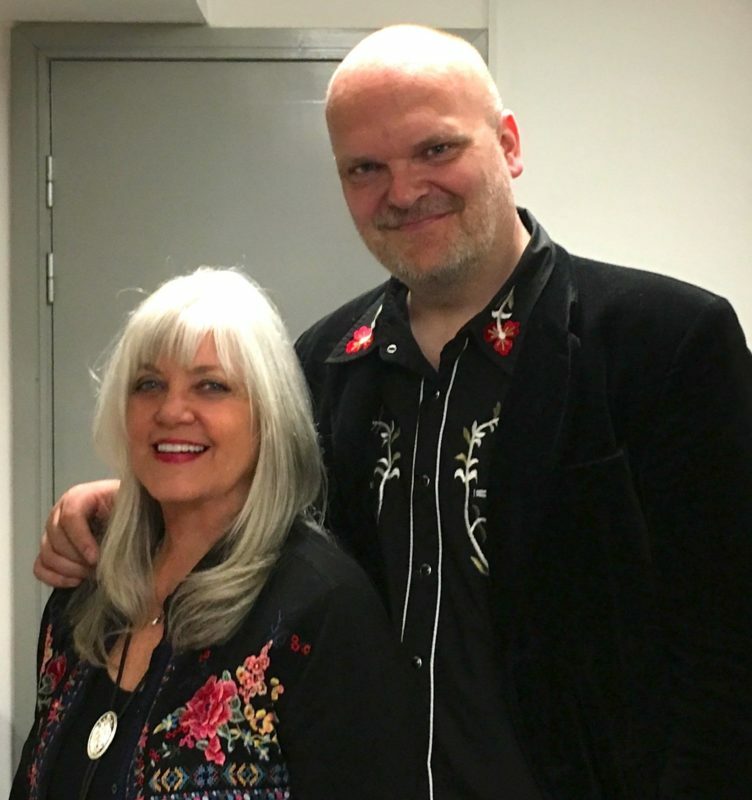 Talking as if they were sitting round a campfire rather than on the stage of a small west London hall, on Friday, 20 April, the Texan songbird Kimmie Rhodes and the English DJ “Whispering” Bob Harris conjured memories of a golden era of country music. 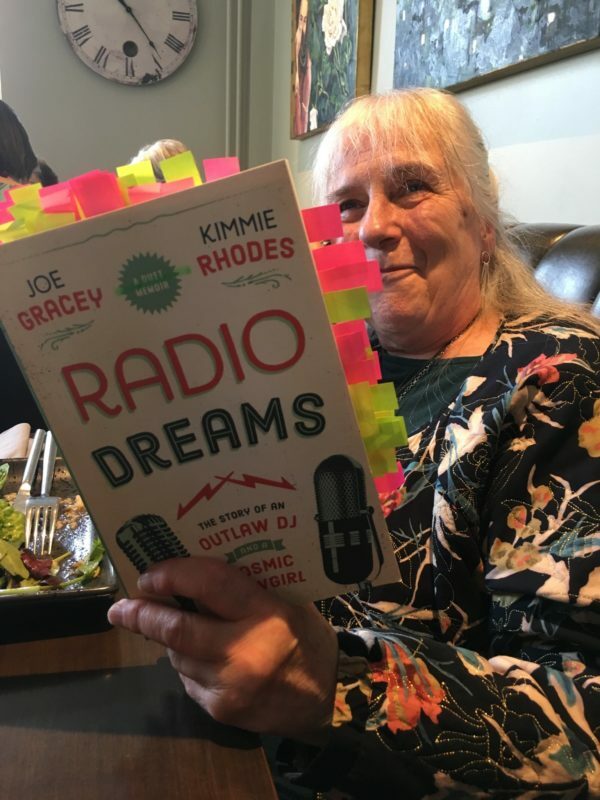 It was the first of a string of low-key Q&A dates to promote Radio Dreams, a new book written by Rhodes and her husband, the late Joe Gracey. Back in the day, Rhodes and Gracey were quite the double act. 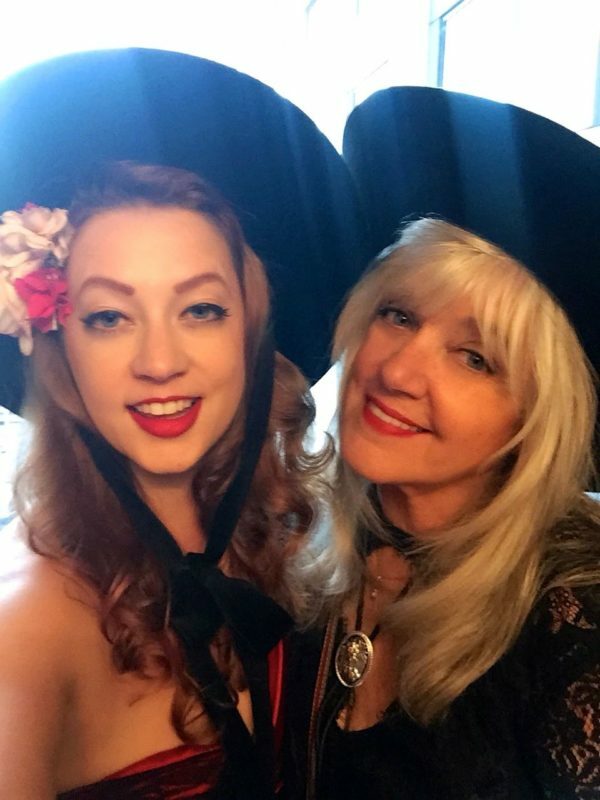 She was raised in Lubbock, where her carnival-worker dad taught her to sing at the age of six. She became a platinum-selling songwriter, recording artist and, later, playwright, theatrical actor and director. 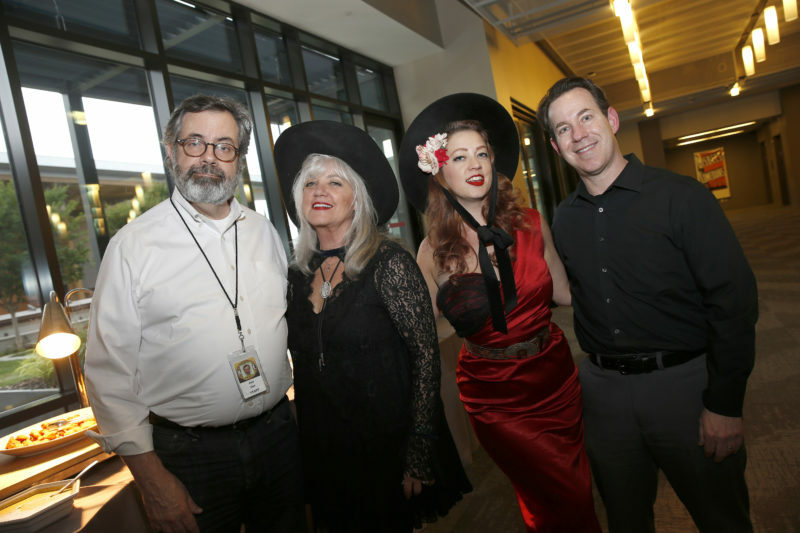 Gracey began a broadcasting career at a radio station in Fort Worth while still a teenager and became an award-winning DJ, songwriter and, later, producer who championed the country scene in Austin. 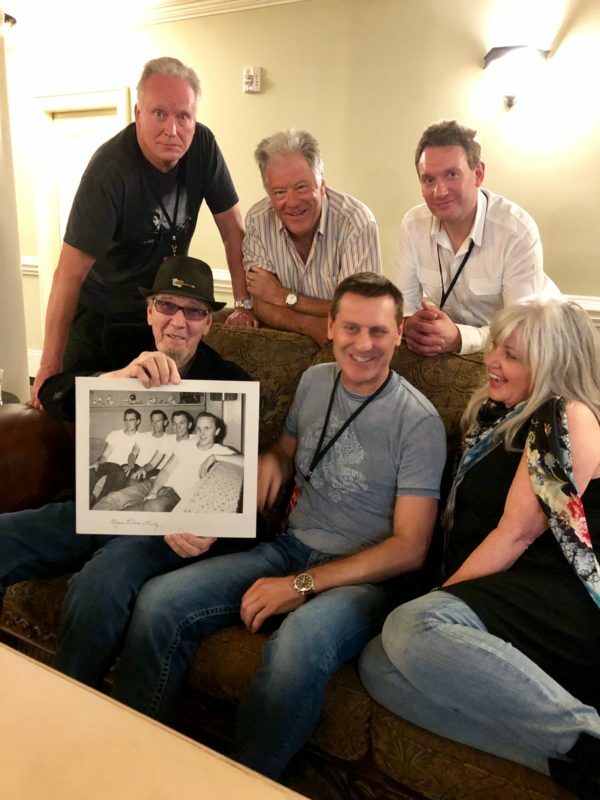 Radio Dreams chronicles their adventures with the Texan “outlaws” who rejuvenated country music in the 70s: Waylon Jennings, Emmylou Harris, Stevie Ray Vaughan, Doug Sahm, Kris Kristofferson and, above all, Willie Nelson. 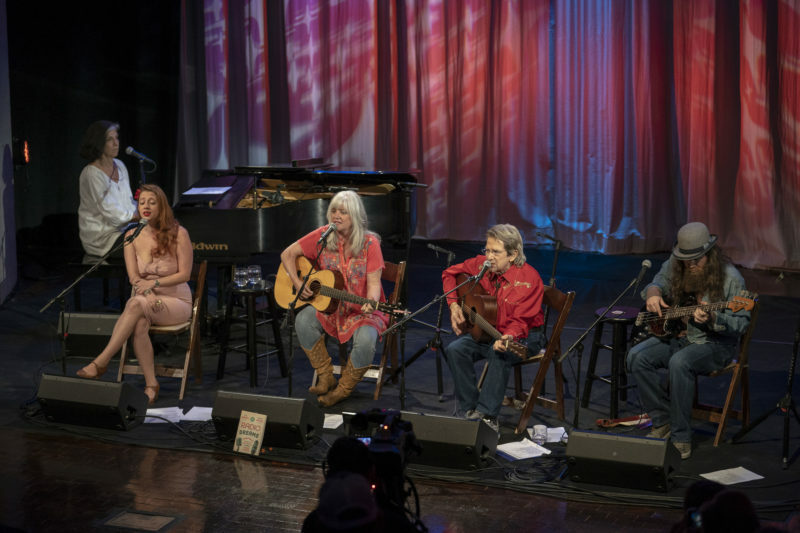 In between the stories, Rhodes sang and strummed a selection of songs as they came up in the conversation, among them ‘We Must Believe In Magic’ (an inspirational favourite by Crystal Gayle), ‘West Texas Heaven’ (the title track of Rhodes’ 1996 album), ‘Just One Love’ (the song she performed with Nelson at Farm Aid in 1990), ‘Love Me Like A Song (the title track of her 2002 album), ‘Raining In My Heart’ (by another Lubbock native, Buddy Holly) and a finale of Ben E King’s evergreen ‘Stand By Me’. 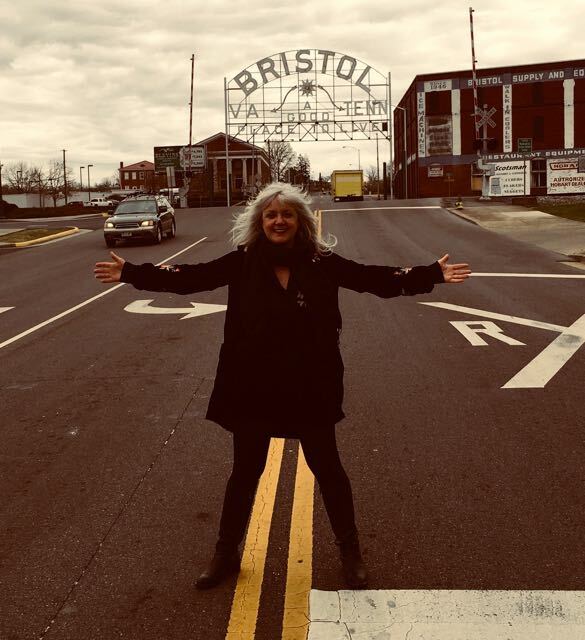 Rhodes was accompanied by her son Gabe Rhodes, a distinguished country music producer himself, who played acoustic guitar with a sensationally precise, twanging touch. And, on some numbers, they were joined by the singer (and support act) Robert Vincent. It was an evening of warmth, wisdom and occasional hilarity. Among the pearls Rhodes shared were the words of Cowboy Jack Clement, who told her: “We’re in the fun business, and if we’re not having fun, we’re not doing our job.” As far as this show was concerned, job done. Radio 2 Legend, OBE decorated and South Oxfordshire resident, Bob Harris, heads to Didcot’s Cornerstone this month in a show that promises to be fascinating, intimate and spontaneous. 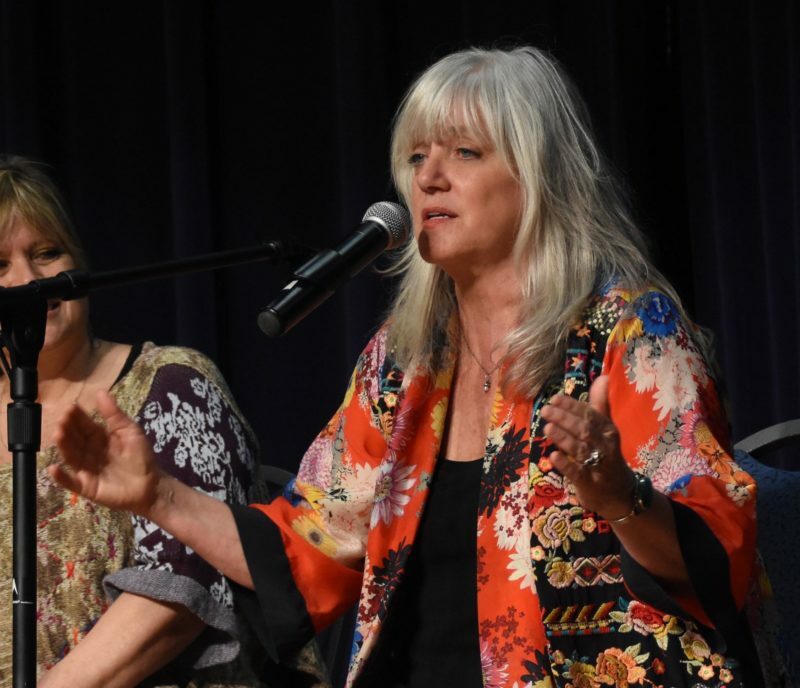 Harris will be engaging in deep conversation and reliving stories and songs with legendary singer/ songwriter Kimmie Rhodes. 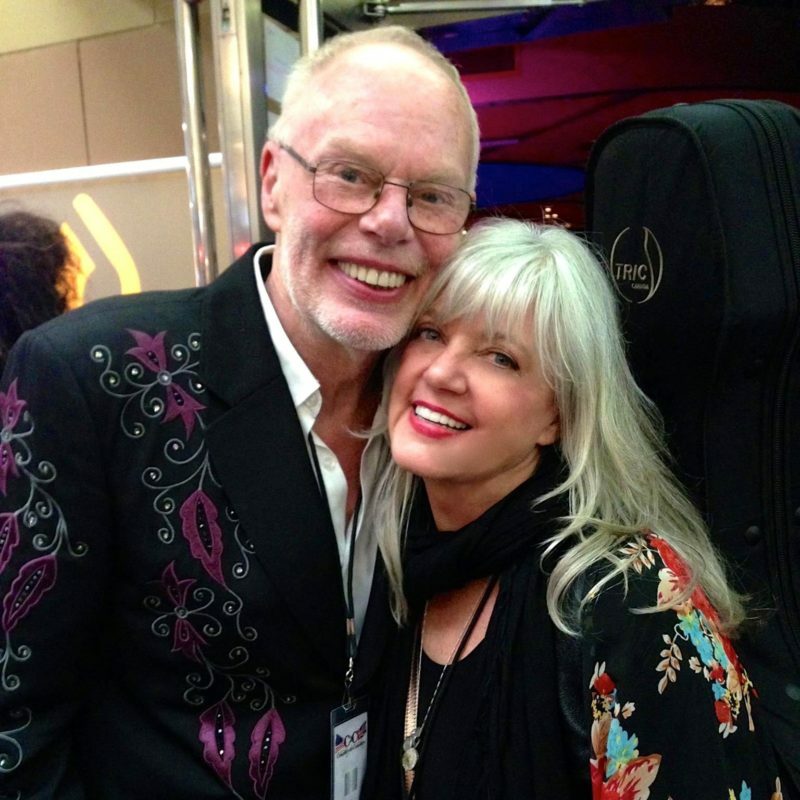 The pair will be reflecting on Kimmie’s rich musical history, the sounds of Austin and the legacy of Texan song-writing, in celebration of the release of Radio Dreams, her memoir and the companion audio CD, produced by ‘Whispering’ Bob Harris. 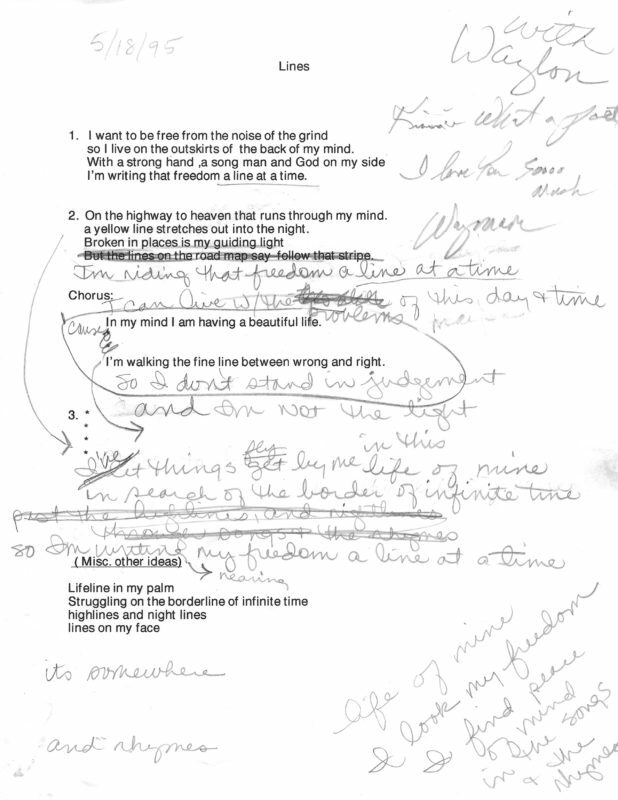 The show is the result of the February release of Radio Dreams, which invites readers into the unique and private world of platinum-selling songwriter and recording artist Rhodes and her deceased soul mate, beloved radio personality Joe Gracey, Jr.
Weaving her own poetic prose with wry and witty words from his journals, Rhodes tells the fascinating story of their three decades together. She also tells tales of the couple’s times with Willie Nelson, Waylon Jennings, Jack Clement, Emmylou Harris, and other famous and infamous characters that have helped make American music history before facing Gracey’s final cancer battle. Through triumph and tragedy, grief and gratitude, her memoirs express the extraordinary life and inspiring love they shared. Described by Radio Times as “one of the greats of British contemporary music broadcasting and an independent champion of great music” Harris has been at the centre of the British music industry for nearly 40 years. 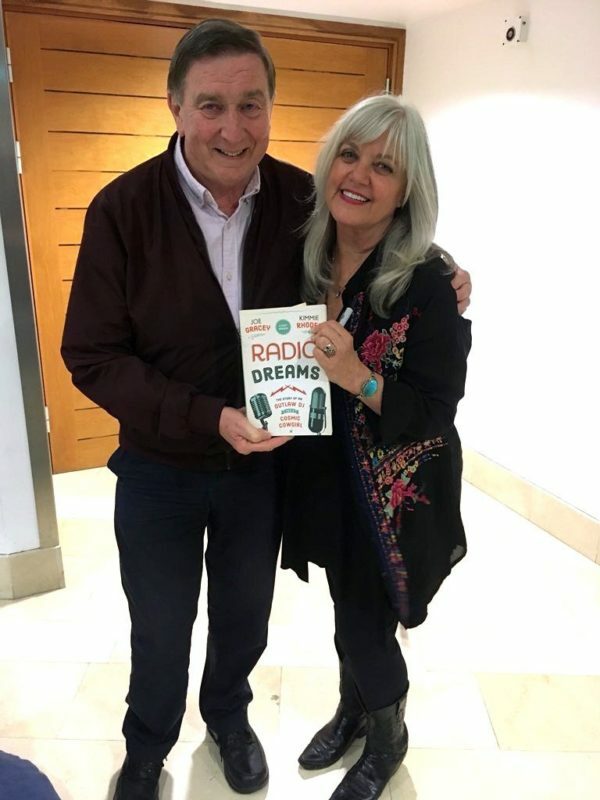 Radio Dreams is on Tuesday April 24 at 7.30pm. 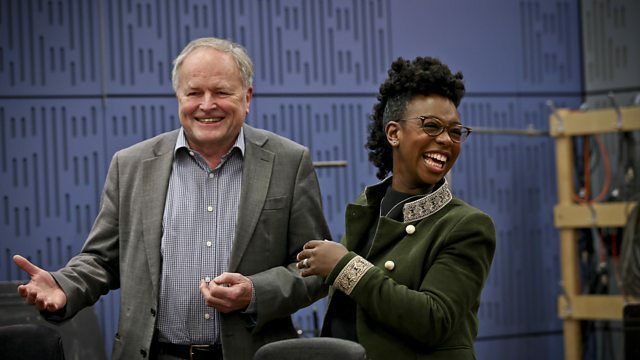 Clive Anderson and YolanDa Brown are joined by Don McLean, Amanda Abbington and In-Sook Chappell for an eclectic mix of conversation, music and comedy. 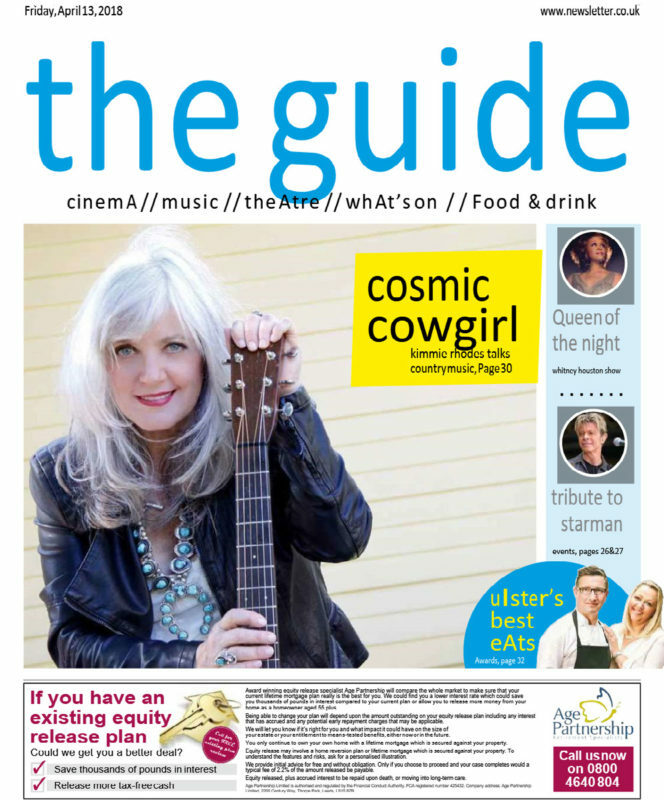 With music from Kimmie Rhodes and The Magic Numbers. 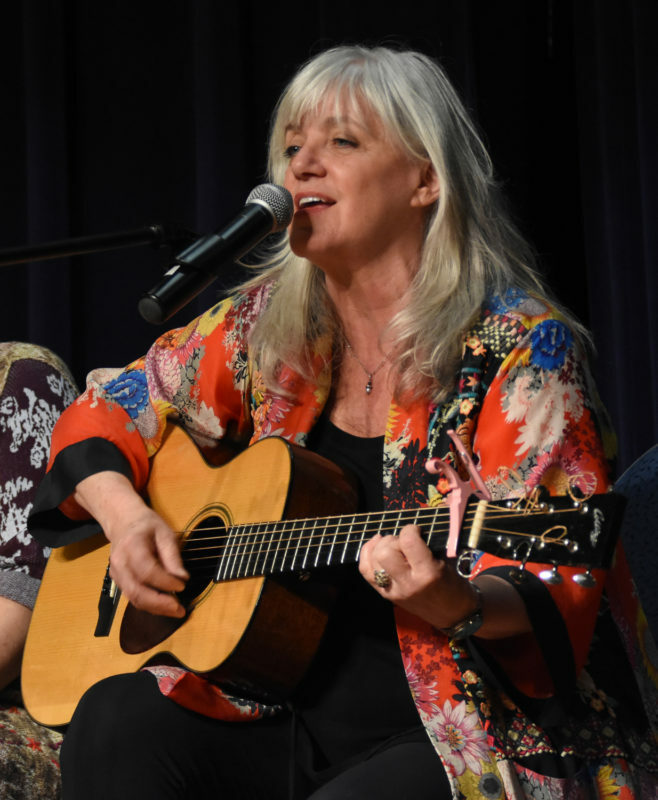 A fascinating, intimate and spontaneous evening of stories and songs with legendary singer and songwriter Kimmie Rhodes – accompanied by guitarist Gabriel Rhodes. 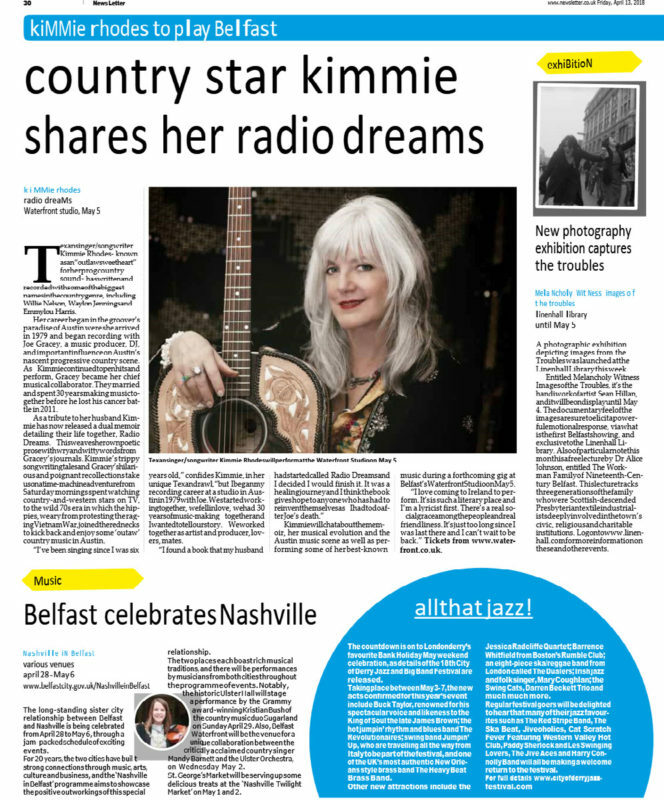 To celebrate of the release of Radio Dreams and the Companion audio documentary – produced by Bob Harris OBE – BBC Radio 2 – this very special ‘In conversation with’ BBC Radio Ulster broadcaster Ralph McLean will reflect on Kimmie’s rich musical history, the sounds of Austin and the legacy of Texas songwriting. 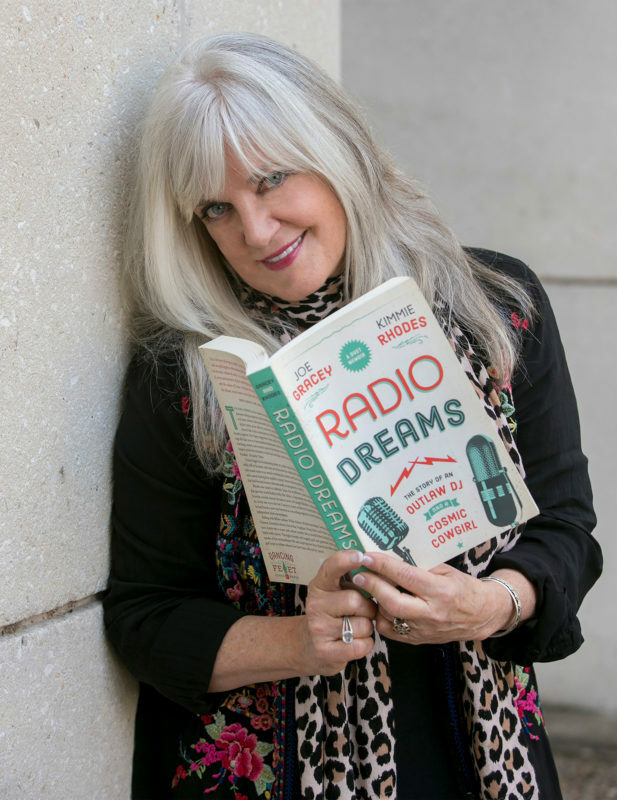 Radio Dreams is a dual memoir which invites readers into the unique and private world of platinum-selling songwriter and recording artist Kimmie Rhodes and her deceased soul mate, beloved radio personality Joe Gracey, Jr.
Weaving her own poetic prose with wry and witty words from his journals, Rhodes returns him to the conversation to tell the fascinating story of their three decades together. Her trippy songwriter’s tales and his hilarious and poignant writings will take you on a time-machine adventure from Saturday mornings spent watching country-and-western stars on TV to the wild ‘70s era in which the hippies, weary from protesting the raging Vietnam War, joined the rednecks to kick back and play some music in the “Groover’s Paradise” of Austin, Texas. 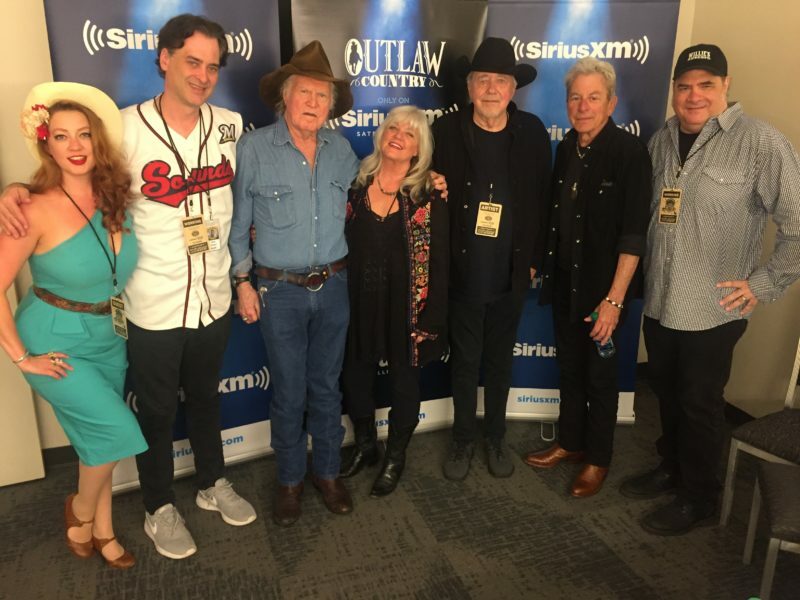 Riding with fellow outlaws Willie Nelson, Waylon Jennings, Cowboy Jack Clement, Emmylou Harris, Stevie Ray Vaughan, Doug Sahm and other famous—and infamous—characters, they help turn Austin into a scene and outlaw country into a sound before facing Gracey’s final cancer battle. Through triumph and tragedy, grief and gratitude, their story speaks of the extraordinary life and inspiring love they shared. 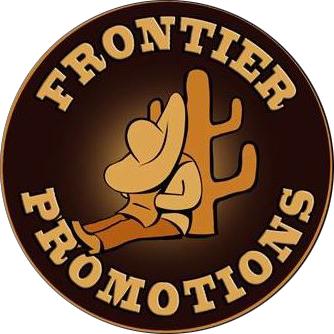 For fans of Texas songwriting and outlaw country music scene this is one story that has to be heard! 1. When did you think about a career in music and what were your first steps into it? Fate landed me in the studio of Joe Gracey in Austin, December 1979. I had a handful of songs I had just written and decided I’d like to try to make a record. It was the luckiest day of my life. 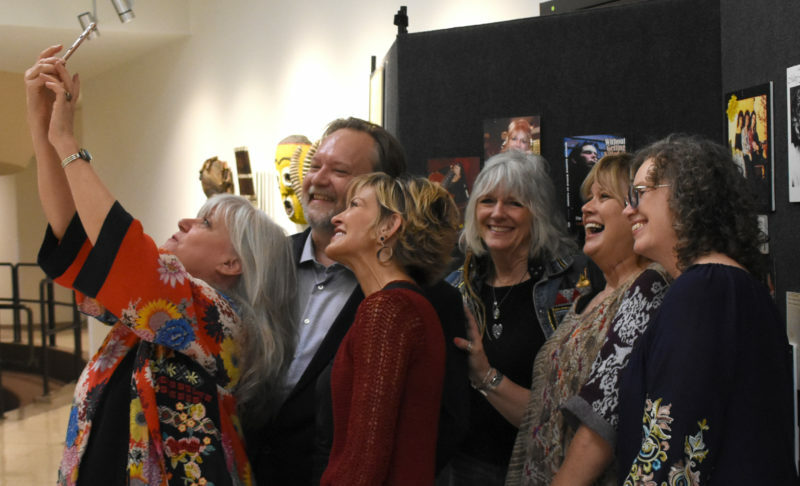 It opened a whole new world to me as an artist and little did I know that Joe Gracey would become the love of my life. Most recently my kids treated me to Brian Wilson and Pet Sounds at Austin City Limits Music Festival, for Mother’s Day, and it was fantastic. I saw the next-to-last show that the famous Texas Playboys did in San Marcos, Texas, in the late 80s. We opened the show and then I sat on the stairs to the stage and just soaked it all in. Another favourite memory of mine, in terms of my own shows, was playing with Willie Nelson and legendary fiddler Johnny Gimble in Indianapolis for 80,000 people at a Farm Aid concert. 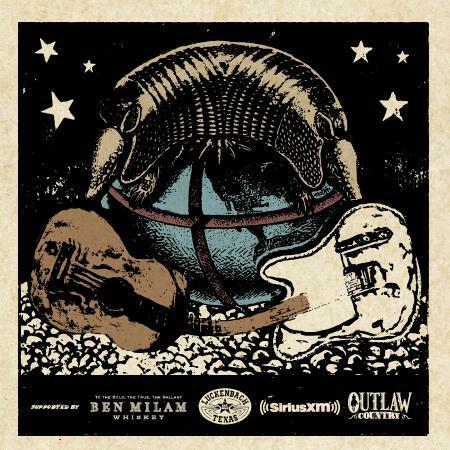 Ray Benson and Asleep at The Wheel or Delbert McClinton. You pick. If we were talking singles I’d have to say Bob Dylan’s Like A Rolling Stone. It’s my favourite record of all time because it’s everything a recording should be… live, spontaneous and incredibly musical. If we’re talking albums I’d take a compilation of my own songs so I could reminisce about the fun I’ve had recording through the years and think of all the great musicians I’ve known and worked with and all the wonderful songwriters I’ve had the pleasure of collaborating with. The Five Things We Cannot Change: And the Happiness We Find by Embracing Them. It would be the best book to read about accepting what we can’t change and therefore I might be able to not go crazy from the isolation. The Blues Brothers, O Brother, Where Art Thou? and Red Headed Stranger – all for the music. Tornado. I went to see it to escape a drought in Texas in July. It was great to be in the dark and watch it rain and hear lightening and thunder for a couple of hours, but the script was just horrible. It was so stupid I wished I could have watched it with the dialogue tracks muted. Alan Lightman, Carl Jung and Shakespeare. I like baseball and don’t care which team long as it’s live, and I used to like to go to University of Texas football games with Joe Gracey. Paris or New York City at Christmas or Venice for New Year’s. 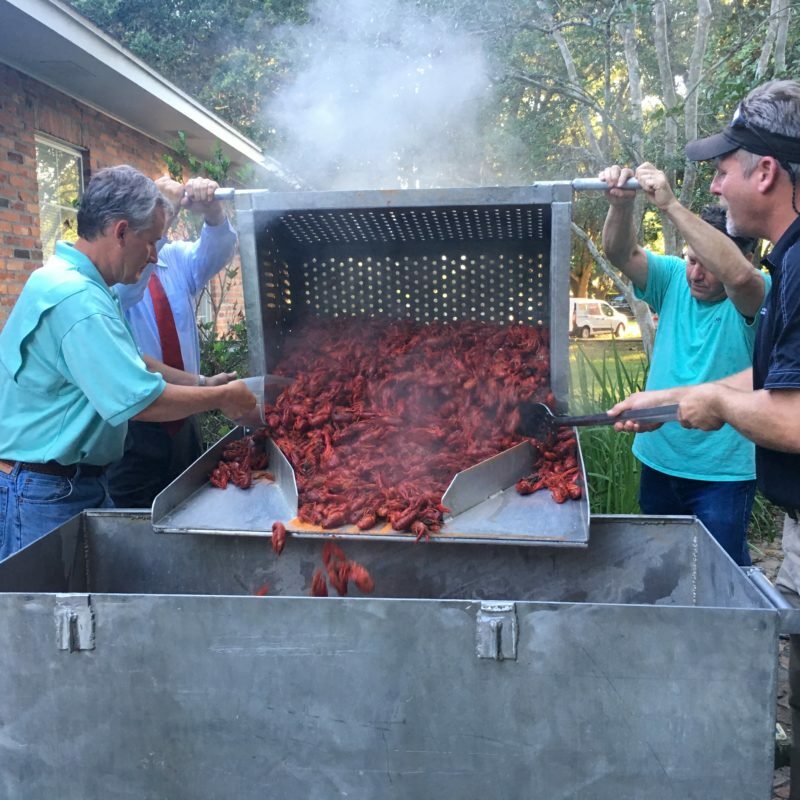 Dinner – Gumbo without okra. Drink – French Rose wine with lots of ice. My mother, because she loves me so much. If God is love, then I believe in God. If God is not love, then I believe in love. Many good and bad things have been done on this Earth in the name of God, but love never fails. 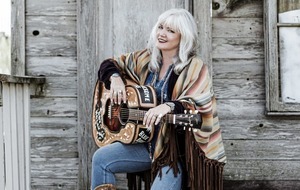 Texan singer/songwriter Kimmie Rhodes – known as an “outlaw sweetheart” for her prog country sound – has written and recorded with some of the biggest names in the country genre, including Willie Nelson, Waylon Jennings and Emmylou Harris. 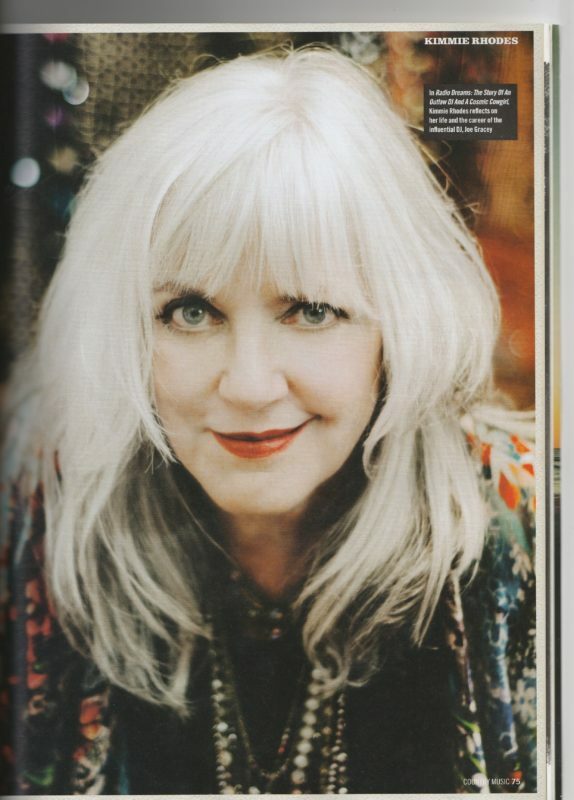 Her career began in the groover’s paradise of Austin were she arrived in 1979 and began recording with Joe Gracey, a music producer, DJ, and important influence on Austin’s nascent progressive country scene. 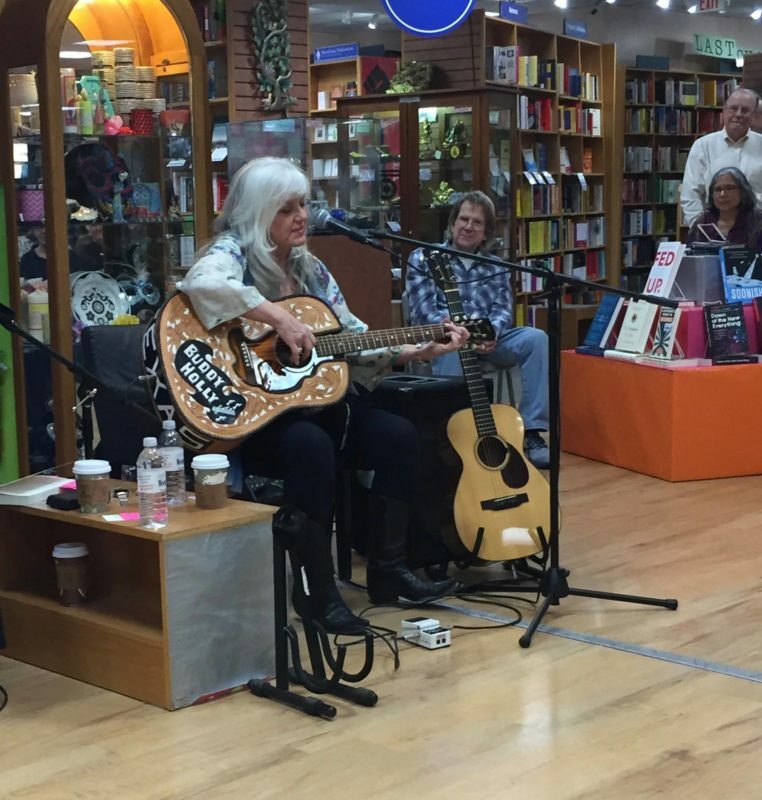 As Kimmie continued to pen hits and perform, Gracey became her chief musical collaborator. They married and spent 30 years making music together before he lost his cancer battle in 2011. 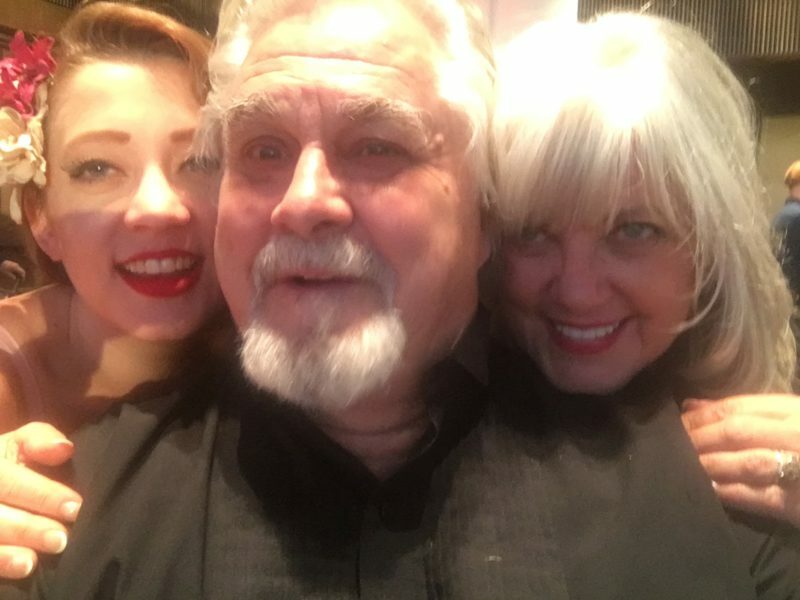 As a tribute to her husband Kimmie has now released a dual memoir detailing their life together, Radio Dreams. This weaves her own poetic prose with wry and witty words from Gracey’s journals. Kimmie’s trippy songwriting tales and Gracey’s hilarious and poignant recollections take us on a time-machine adventure from Saturday mornings spent watching country-and-western stars on TV, to the wild 70s era in which the hippies, weary from protesting the raging Vietnam War, joined the rednecks to kick back and enjoy some ‘outaw’ country music in Austin. 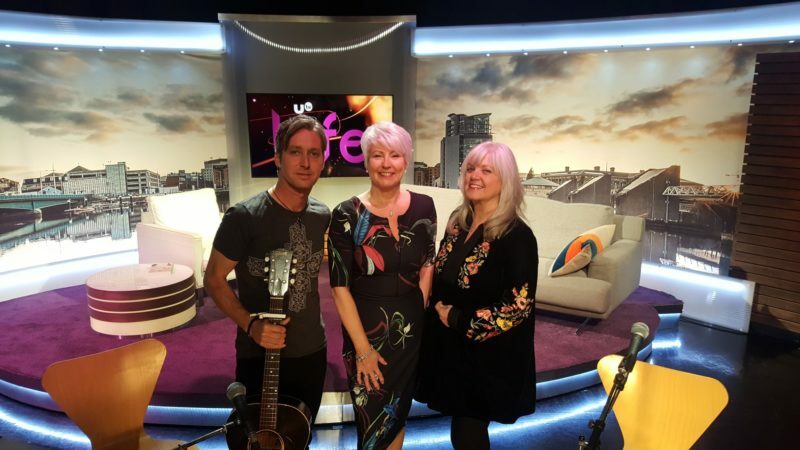 Music journalist Stuart Bailie talks about music during the Northern Ireland conflict along with singer-songwriter Joby Fox, platinum-selling country artist Kimmie Rhodes talks about her memoir ‘Radio Dreams’ and sings live – plus Rita checks out the spectacular light installation atThe Argory in Moy. 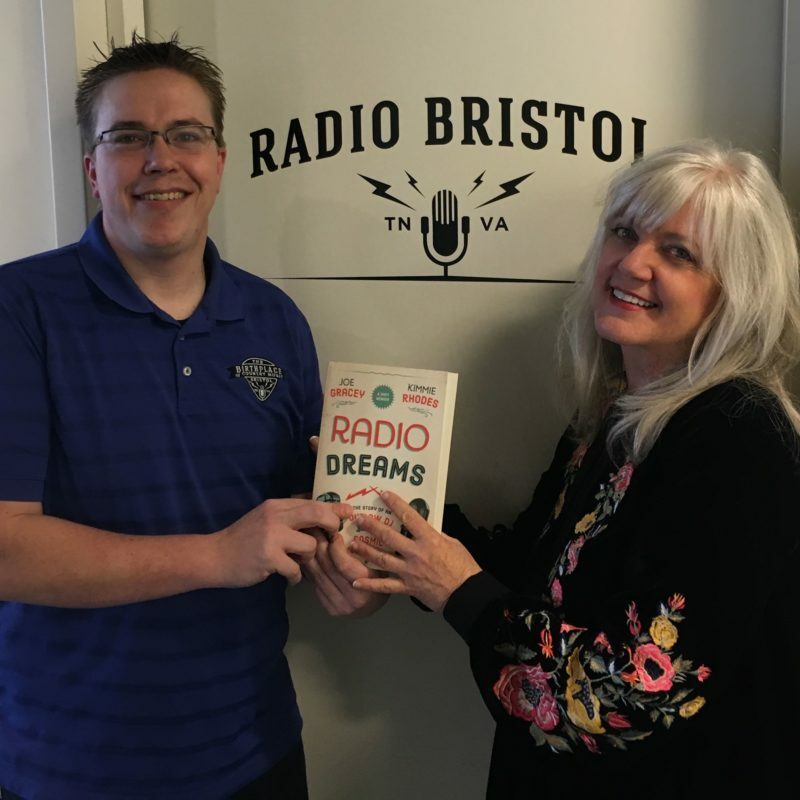 Happy to say that my Radio Dreams book is now in the book shop at the Birth Place of Country Music Museum where plans are now in the works for future events there. 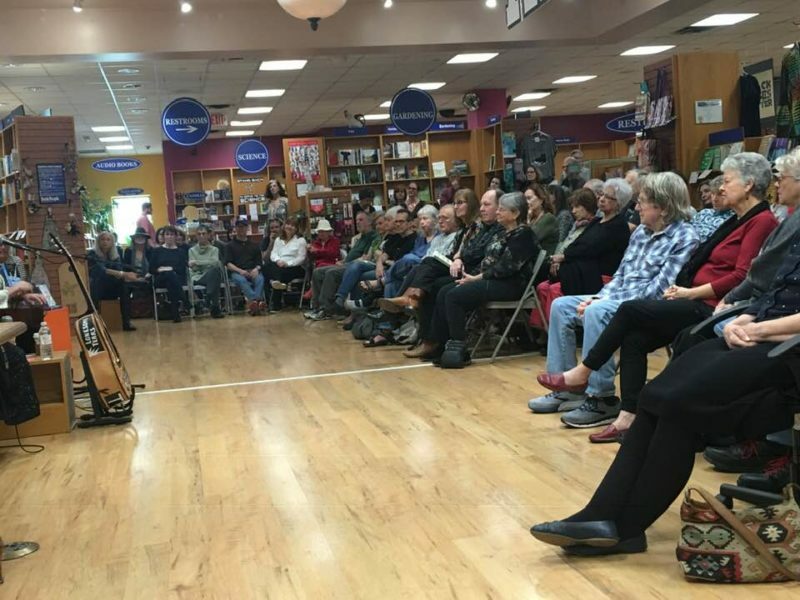 We played a private house concert and book signing and then a gig at the famous Down Home venue with a stellar band of players John put together. The audience was fantastic. 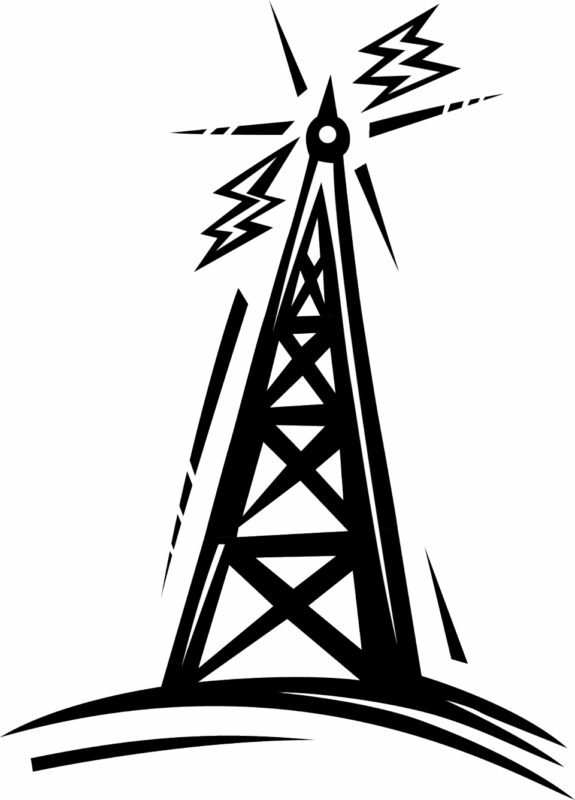 Links and pictures are posted below along with excerpts from a couple of the radio shows. 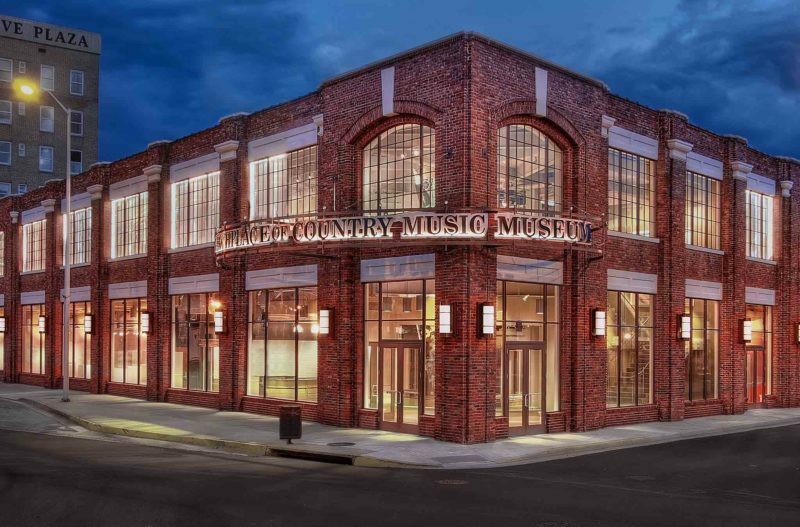 The Birthplace of Country Music Museum, an affiliate of the Smithsonian Institution, tells the story of the 1927 Bristol Sessions recordings by the Carter Family, Jimmie Rodgers, Ernest V. Stoneman, and others – recordings that were influential in shaping the sounds and practices of early commercial country music. 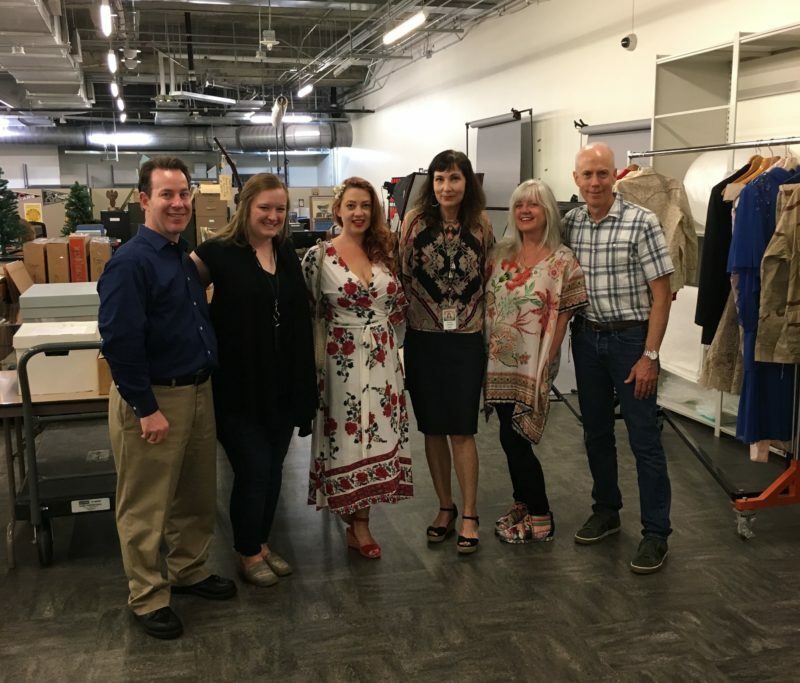 The museum explores how this rich musical heritage lives on in today’s music, and how music from our region continues to influence music around the world. 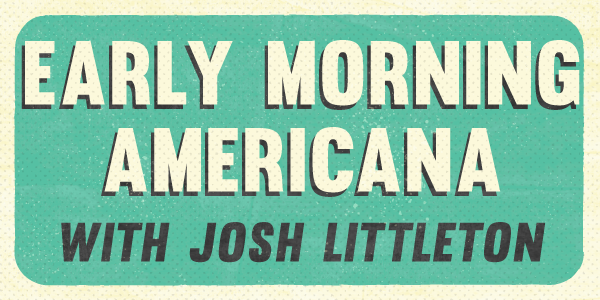 Join Josh Littleton every weekday morning from 7:30am to 9:00am Eastern for “Early Morning Americana” featuring a wide variety of the most recent Americana releases with a healthy dose of bluegrass and classic country mixed in ensuring you’ll wake up bright eyed and bushy tailed. This program, hosted by Susan Lachmann, promotes, supports and illuminates women’s voices. 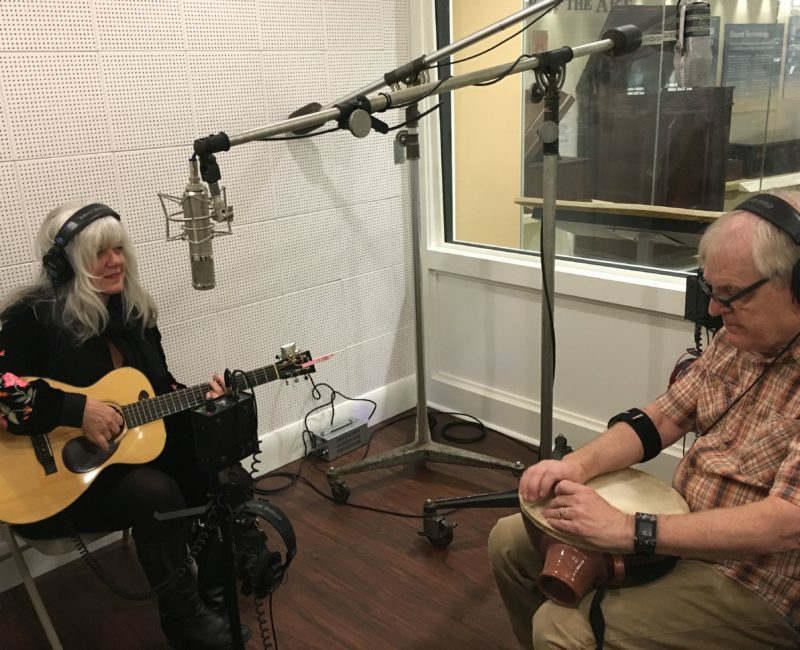 Now in its 27th year, the program features guests ranging from regional musician Amythyst Kiah to author Adriana Trigiani. 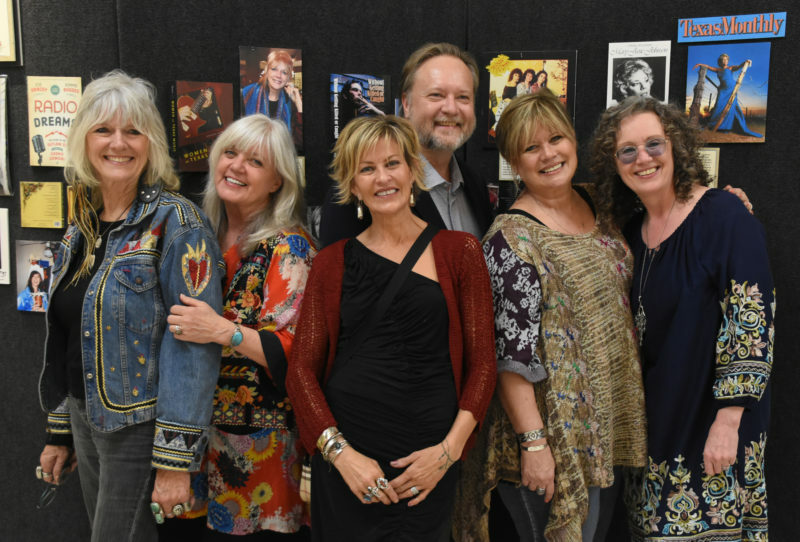 “Women On Air” previously aired on WETS-FM’s HD2 Americana stream on Sunday evenings and overnight on Fridays. 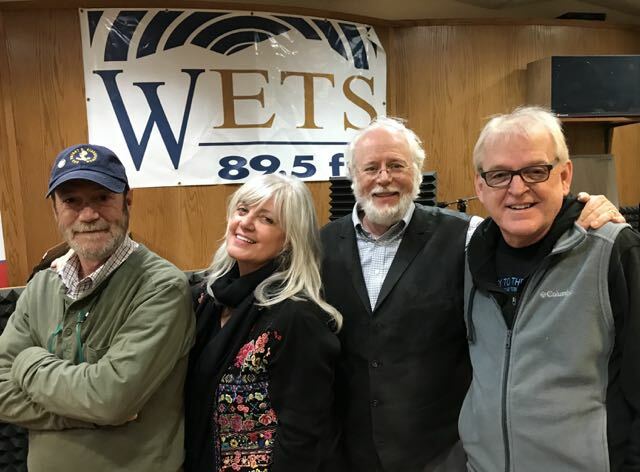 Listeners may tune to WETS-FM 89.5 or visit www.wets.org to listen to the HD1 live stream. Nothing like making some closet space! 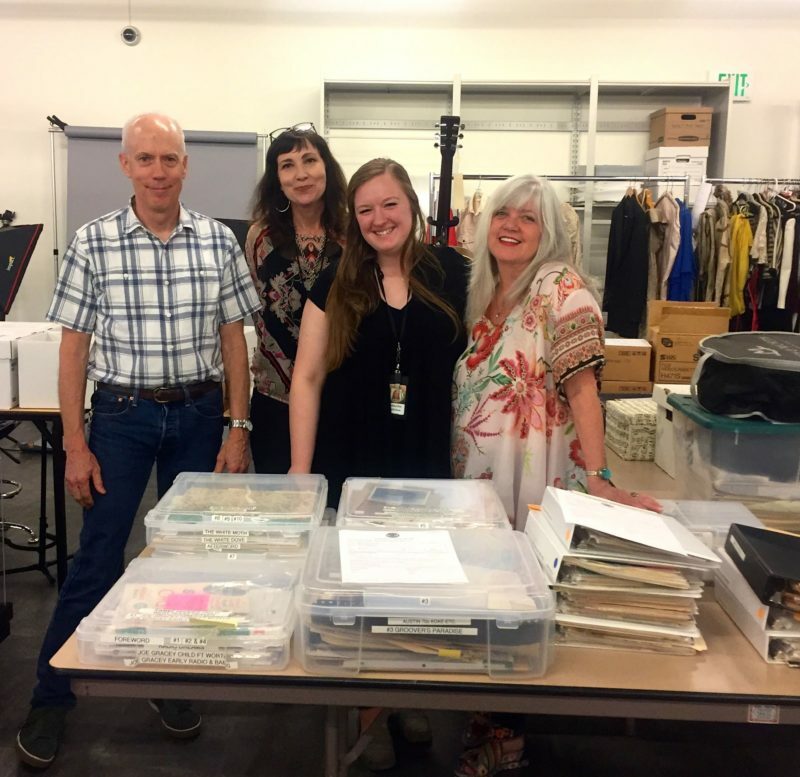 The Country Hall of FameMuseum movers came last week and with the help of our dear daughter, Jolie Goodnight Gracey ,helped us to place 3o boxes plus of archives where they belong. 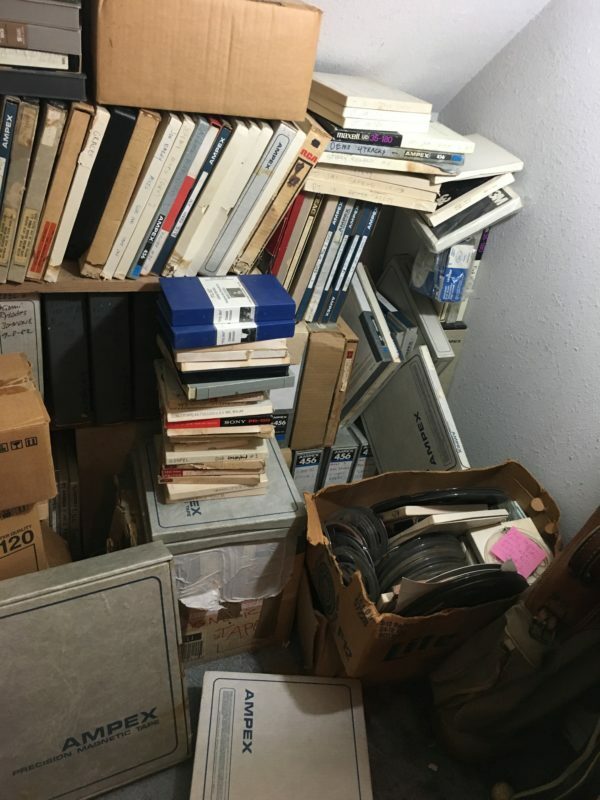 Its an honor to have placed not just Joe Gracey’s legacy but to have his many archives find a home at the museum; periodicals, artifacts and especially a vast number of rare reel to reel recordings done by Gracey in the 70s in Austin. 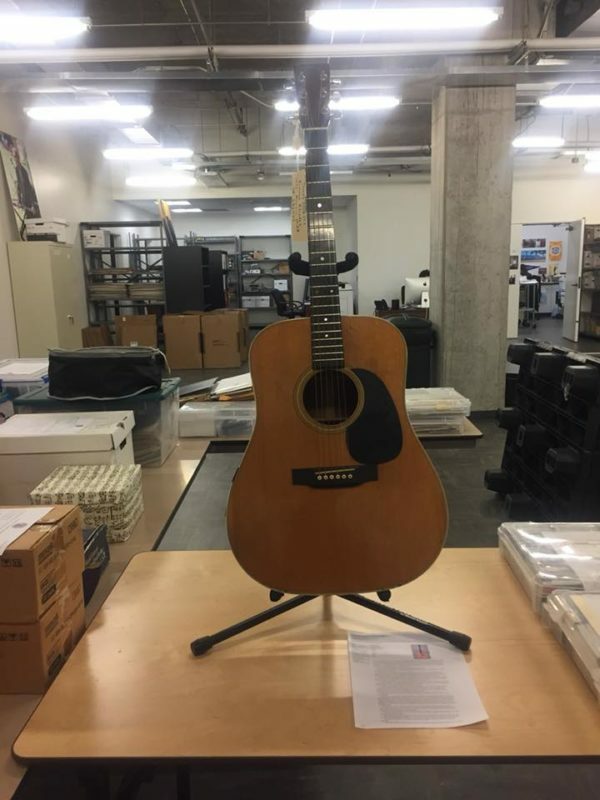 Way before digital recording existed he dragged his 4 track TEAC recorder all over Austin and captured the spirit of what The Country Music Hall of Fame Museum is calling “Country’s Roaring 70s” in their “Outlaws and Armadillos” exhibit which opens May 25 and will run for 3 years. 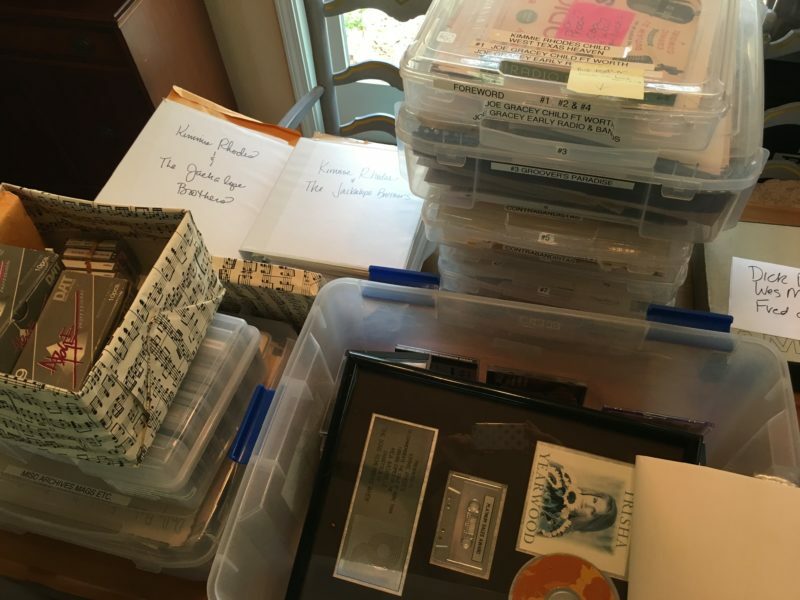 I also sent my Christian Lacroix dress I wore on the cover of my album “Angels Get The Blues” (recorded at Sun Studios with Cowboy Jack Clement) multi-tracks and archives that had to do with my “Outlaw Sweetheart” days working with Willie and Waylon and “the boys” and some platinum records I have received for my songs. 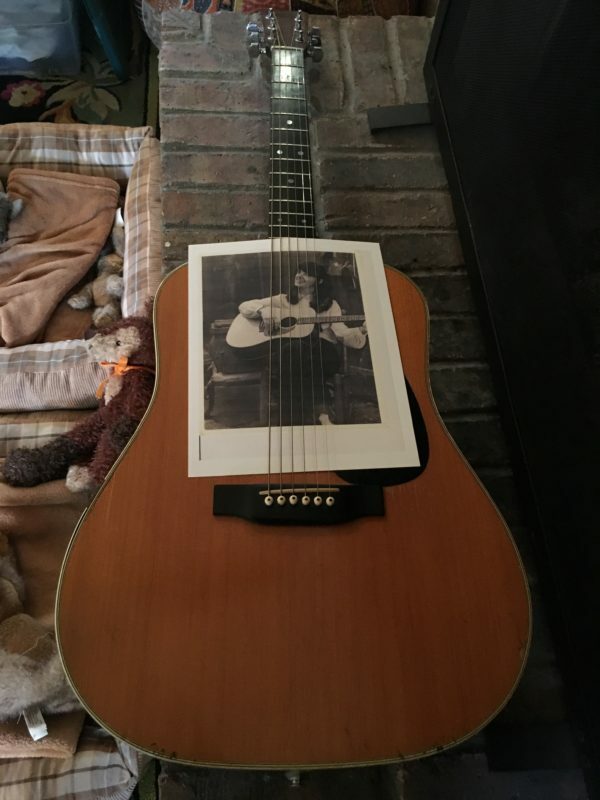 It was an especially poignant moment to let go of my Rosewood D28 CF Martin guitar but I am happy and honored to have it there where it will also receive some badly needed repair. 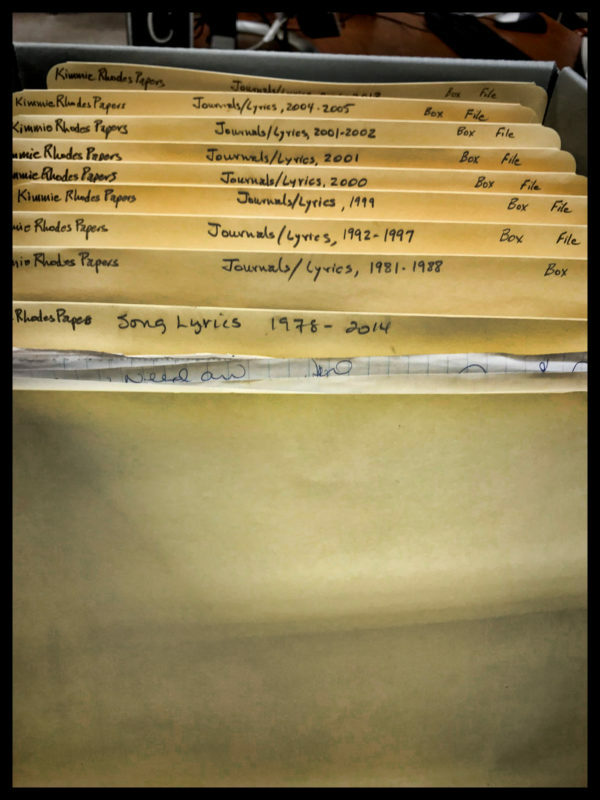 Thanks so much to all of you who contributed to the Radio Dreams project to help make these promises to place these archives in safe-keeping where they can be properly catalogued and available for research for future generations of music lovers. What an adventure! 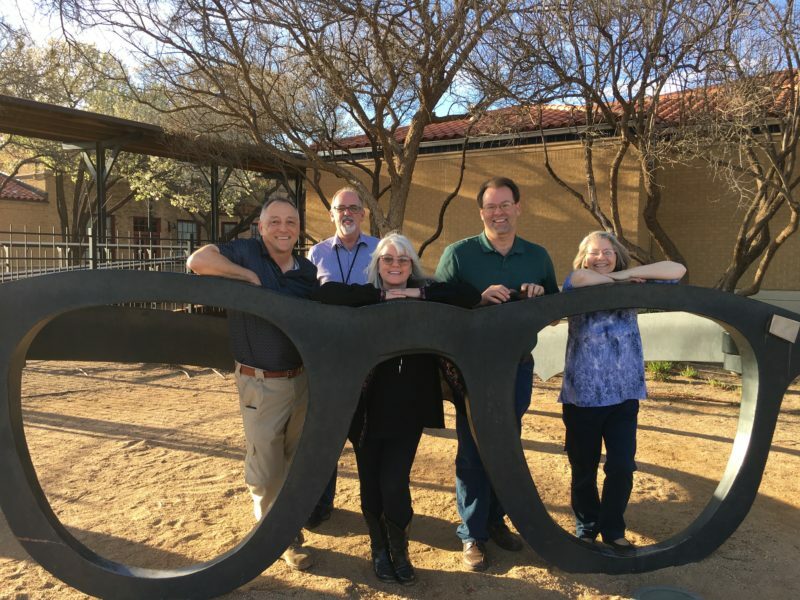 I just spent last week in my hometown Lubbock, Texas with some really great people getting a LOT of good work done on the Radio Dreams Project, working in the Crossroads of Texas Music archives department at Texas Tech, helping hand over many pictures, recordings, writings, memorabilia, costumes, original scripts and drawings from theatre productions. I also visited and lectured a 20th Century Music, Texas Music Race Class and Gender, Women’s Studies and songwriting class. Thanks to all of you who made this possible by supporting the Radio Dreams Project! Below are some pictures taken of the work and events. 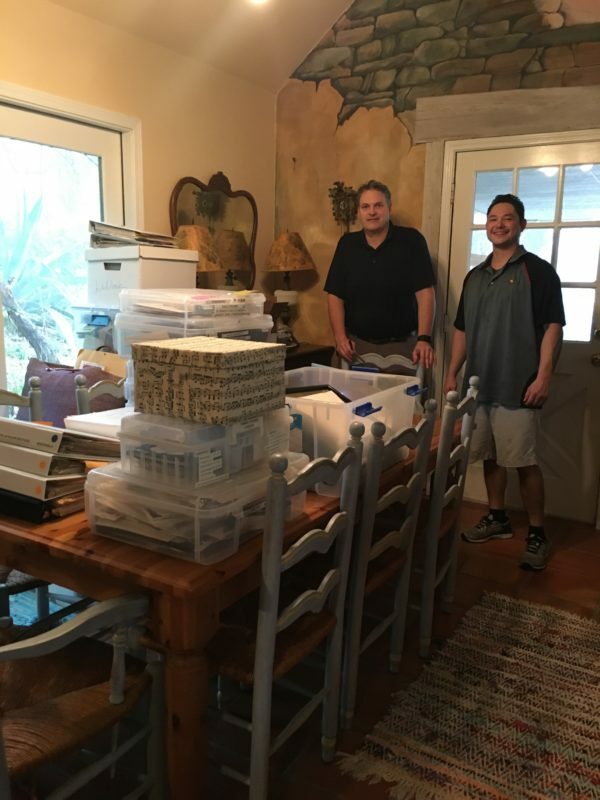 PS Special thanks to Curtis and Amber Peoples, Jim and Kathy Gilbreath and Bella and Grant Gerlich for feeding us and making us feel welcomed! 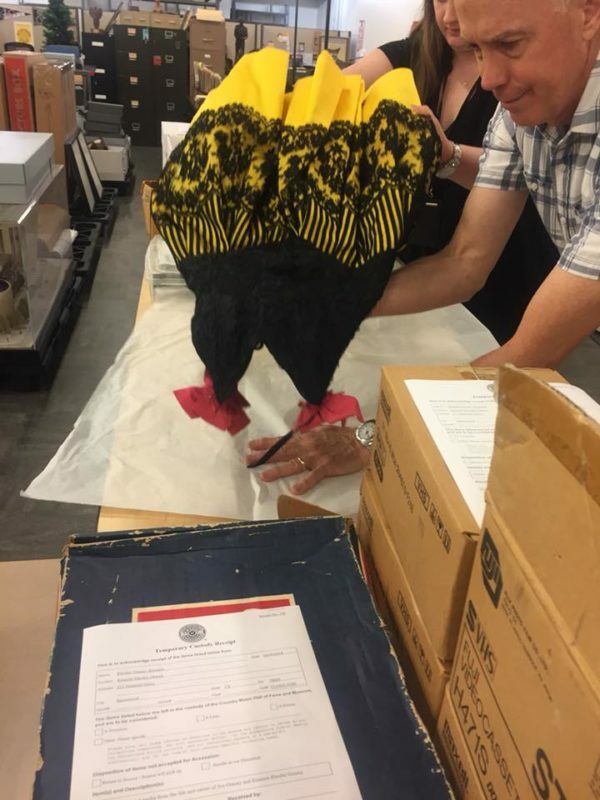 Working with Jon Holmes, the archives manager, was a lot of fun and a real education in how to do it right. He’s the most organized human on the planet! We told LOTS of stories. He made me remember and label the date of everything. He even brought down the Jesse Taylor photographs so Diana Hendricks and I could help identify the people in them. Archives 20% processed after one week of work. 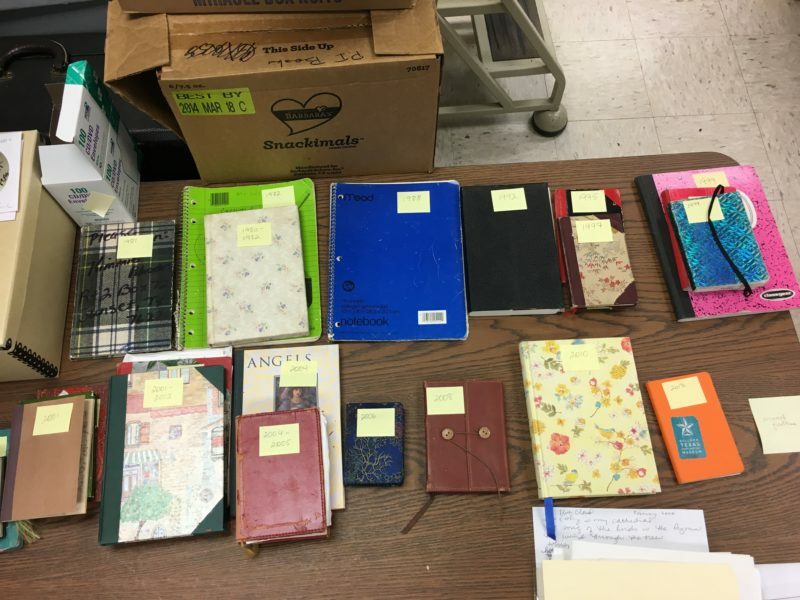 Three decades of my writing journals, finally dated and in chronological order. Many unfinished songs in there! Dr. Curtis Peoples, historian and head of the department, checked in on us regularly. His dedication and passion for preserving and recording the history is an inspiration. 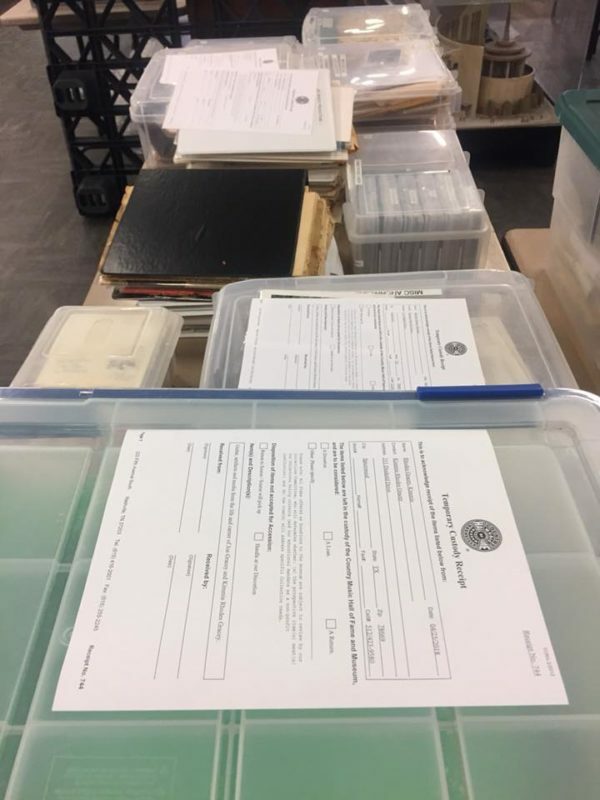 I’m very grateful for his interest and his help placing these archives in a permanent place where they can be used for education and research. Curtis not only booked all the events for the adventure and arranged scheduling but also escorted me to all of the classes I visited and lectured during the week. 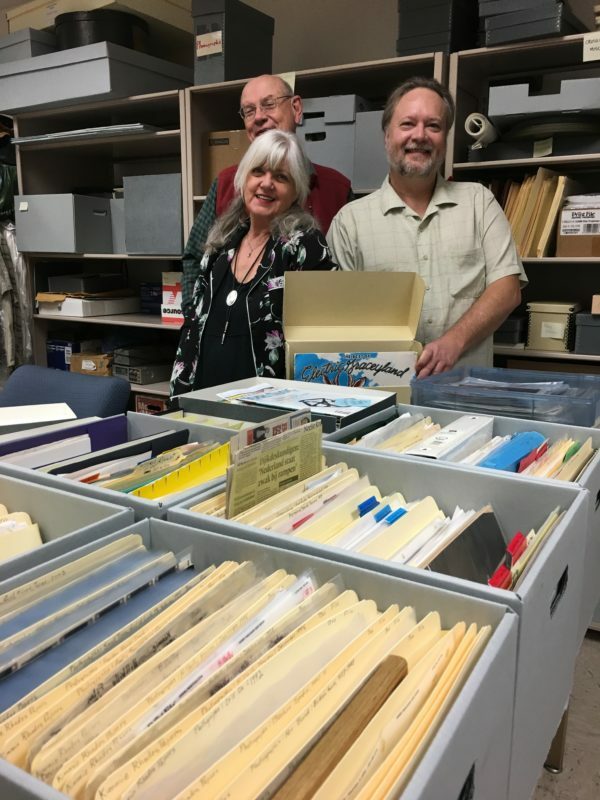 John Holmes, Kimmie Rhodes & Curtis Peoples in the archives department. 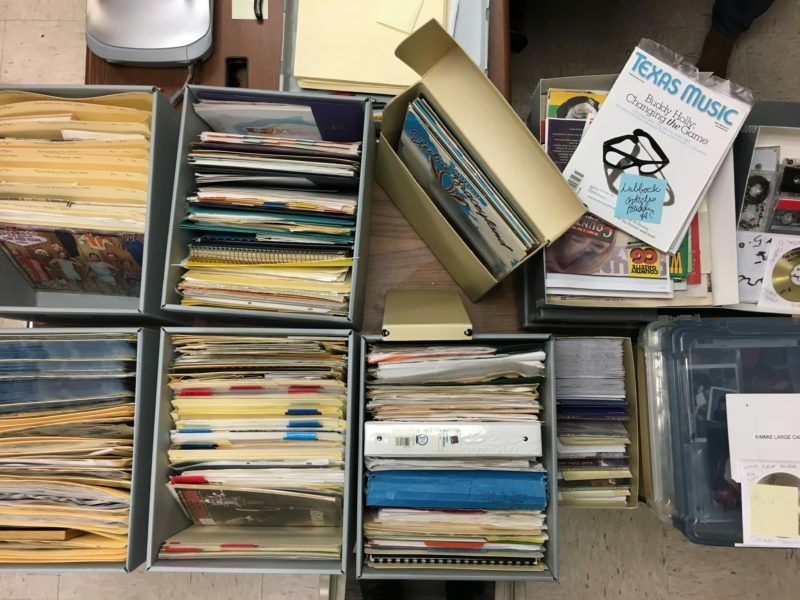 Journals and lyrics dated and labeled and filed in acid free materials ready for processing and cataloguing.